Latest Pointe Dance Shoes styles for sale online from top brands including Gamba, Bloch, and Grishko. 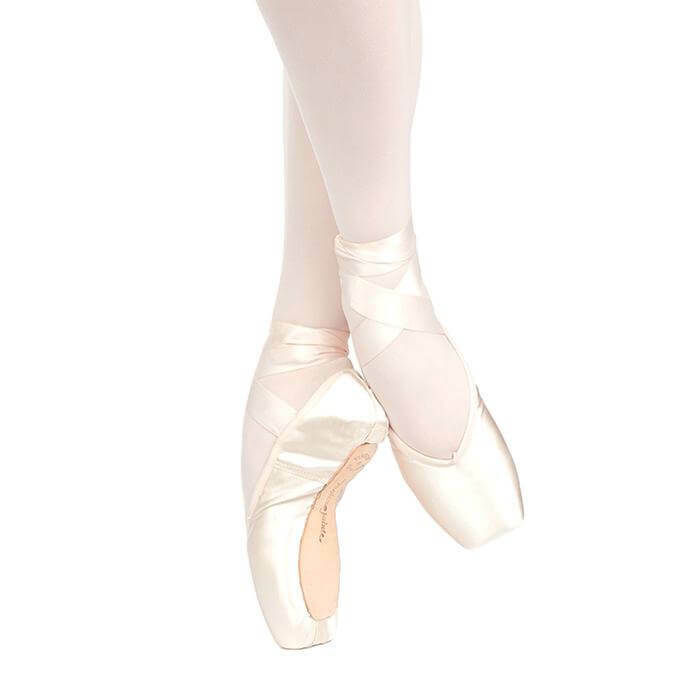 Fuzi Adult Pre-Arched Pointe Shoes PA107: Fuzi's pre-arched pointe shoes feature a wider toe box with a small cushion in the tip, a low u-vamp, a soft lining, and lowered sides. New technology greatly reduces noise and makes the shoe more flexible while still staying strong. Gaynor Minden Adult Pointe Shoes GMP: Gaynor Minden pointe shoes are different from other pointe shoes. They have a beautiful classic look on the outside, but a fully modernized interior to meet the needs of today's athletic dancers. The shanks and boxes are made from polymers prized for extraordinary flexibility, strength, and resilience. Gaynor Minden pointe shoes have been tested to withstand hundreds of thousands of releves without any weakening or deformation of the shank or box. Shanks are available in five different flexibilities to ensure appropriate support for dancers at all levels and of varying body types. The linings are treated with silver ion, and are textured to help prevent the shoe from sliding. Poron Performance Cushioning throughout absorbs impact and noise, and makes the shoes incredibly comfortable. Because Gaynor Minden pointe shoe boxes and shanks do not deteriorate or lose their shape, they must never be fitted too tight, too wide, or too stiff. You can achieve a customized fit by selecting model, length, width, box, shank, vamp, and heel specifications. Model-inch refers to the shape of your foot. Width-inch refers to the midfoot area, behind the box. You can now select from four box options, from very narrow and tapered (#2), to the new widest and square option, (#5). 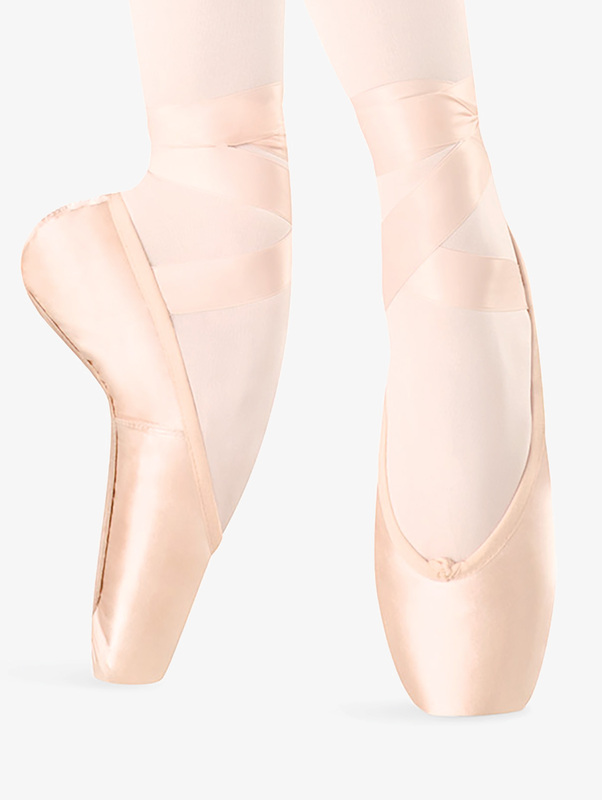 Gaynor Minden Womens Sculpted Fit Pointe Shoes SCP: Gaynor Minden pointe shoes are completely different from other pointe shoes. They have a beautiful classic look on the outside, but a fully modernized interior to meet the needs of today's athletic dancers. The shanks and boxes are made from polymers prized for extraordinary flexibility, strength, and resilience. 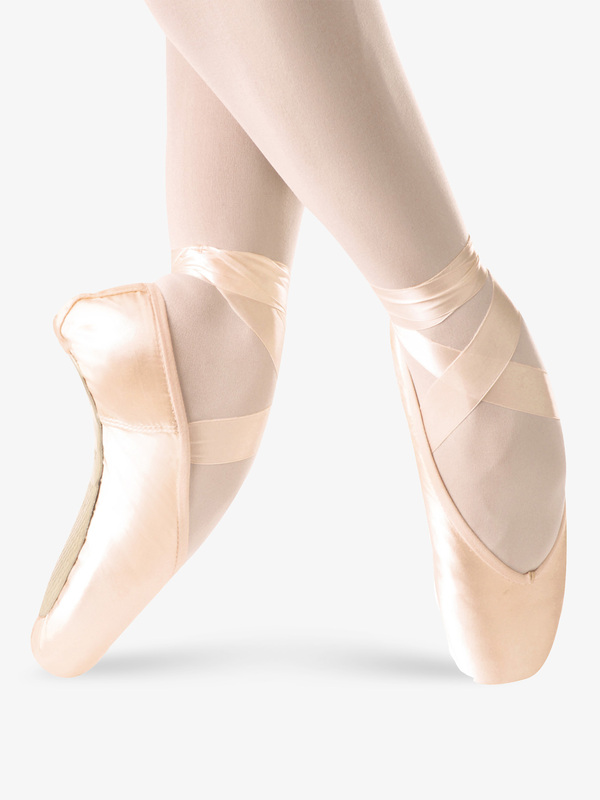 Gaynor Minden pointe shoes have been tested to withstand hundreds of thousands of releve's without any weakening or deformation of the shank or box. Shanks are available in five different variations of stiffness to ensure appropriate support for dancers at all levels. Textured Poron linings are treated with silver ion, and are slightly textured to help prevent the shoe from sliding along the foot. The linings absorb impact, noise, and make the shoes incredibly comfortable.For those who find the Classic Fit-inch too wide and the Sleek Fit-inch too tapered, Gaynor Minden now introduces the Sculpted Fit! 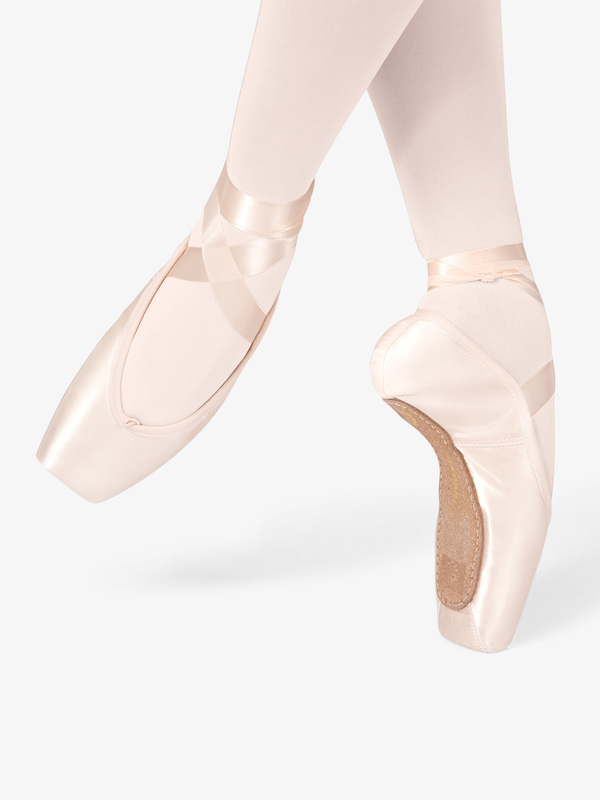 These satin pointe shoes feature generously cut metatarsal, a narrow-medium heel, and a sculpted-inch mid-foot that securely hugs the arch providing clean lines and extra support. Grishko Adult 2007 Pointe Shoes 2007: Grishko's most popular model and the premier Russian-made pointe shoe, 2007 fits a remarkable variety of feet and has a beautiful, sleek appearance. Its anatomical form was designed to relieve pressure on the big toe joint, based on targeted studies of foot shape and pointework dynamics. 2007 is lightweight, supportive and comfortable, with a somewhat tapered box and medium platform, supportive yet non-constrictive medium-height U-shaped vamp, and 3/4-length shank with Grishko's roll-through design. Shank: Super Soft, Medium, Hard (specify when ordering). Suede sole; cotton drawstring; ribbons not included. Grishko pointe shoes are made in Moscow, Russia, by expert cobblers who craft each shoe individually by hand, using natural, non-toxic materials. The company designs its shoes based on in-depth study of anatomy and function, to best ensure superb performance and protect dancers' health and safety on pointe. Grishko's attention to detail includes balancing each shoe by hand; using cotton drawstrings to protect against tendonitis over-tightened elastic can cause; using glues that help the toe box mold beautifully to the foot; maintaining shank mobility at the heel without sacrificing support; designing both platforms and soles to be flat and stable for excellent balance on and off pointe; and selecting only the finest satin for a beautiful appearance. 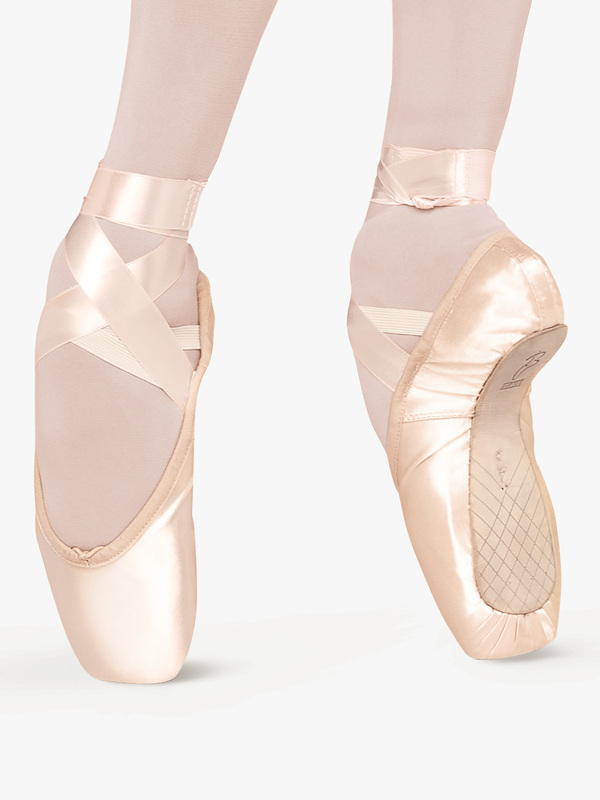 Grishko pointe shoes are considered reliable, durable and consistent. Grishko Adult Elite Pointe Shoes ELITE: Grishko's Elite is a revolutionary shoe for dancers with short, even-length toes, who may find other pointe shoes too tapered, and for feet with extra width throughout. Elite's square shape features a short U-shaped vamp, broad platform, wide heel and supportive full-length shank. Grishko pointe shoes are made in Moscow, Russia, by expert cobblers who craft each shoe individually by hand, using natural, non-toxic materials. The company designs its shoes based on in-depth study of anatomy and function, to best ensure superb performance and protect dancers' health and safety on pointe. Grishko's attention to detail includes balancing each shoe by hand; using cotton drawstrings to protect against tendonitis over-tightened elastic can cause; using glues that help the toe box mold beautifully to the foot; maintaining shank mobility at the heel without sacrificing support; designing both platforms and soles to be flat and stable for excellent balance on and off pointe; and selecting only the finest satin for a beautiful appearance. 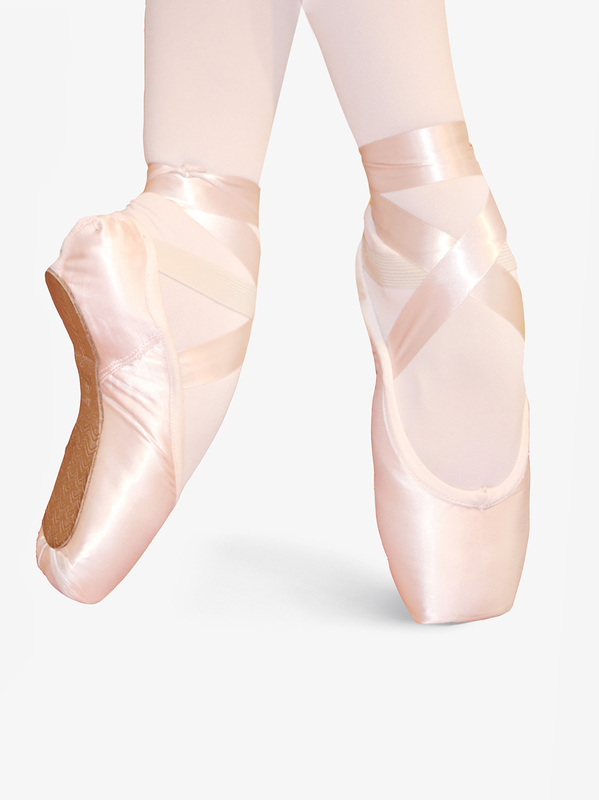 Grishko pointe shoes are considered reliable, durable and consistent.Available in Medium or Hard shanks; please specify when ordering. Now with drawstring. Ribbons not included.Color:Light European Pink Satin. Russian Pointe Adult Sapfir Pointe Shoes (Sapphire) SD: Lightweight and quiet with a sleek pleatless toe platform, non-slip leather sole and excellent stability, the Russian Pointe Sapfir (Russian for sapphire) is best suited to the less-full foot with moderately tapered toes. Sapfir features a medium toe platform, low crown, and fuller heel shape for the foot with less taper from metatarsal area to heel. Pre-arched construction mimics the shape of the foot en pointe, enhances the beauty of the arch, decreases pressure on the front of the foot for high arches, and minimizes break-in. Next-generation shanks provide flexibility and durability. Handcrafted in Russia in the grand tradition of pointe shoemaking. FREE Ribbons and Elastic Included with each pair! 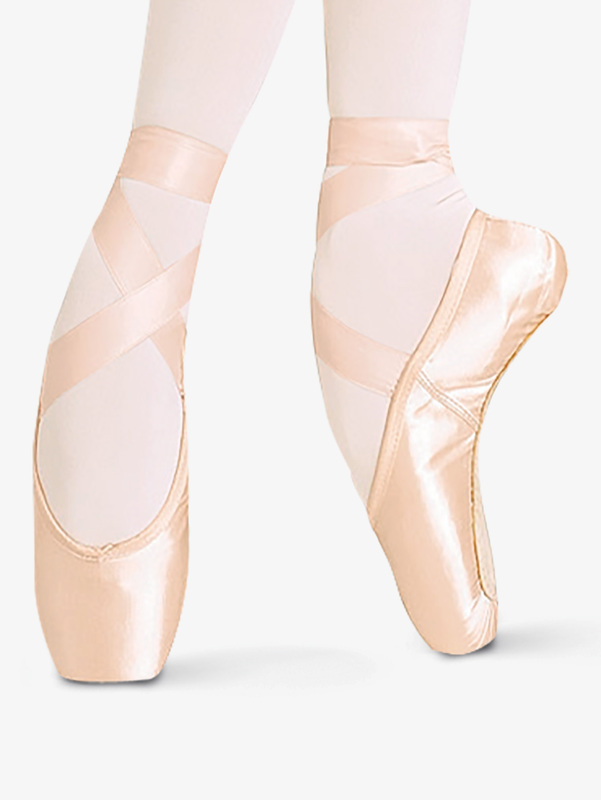 Sansha Adult American Soft-Toe Pointe Shoes DP808: These shoes are built on Sansha's premiere last and are perfect for class, exams, and performances; featuring a squarer box and a soft sole. Soft demi-pointe are not to be used for pointe work. Elastic is included. 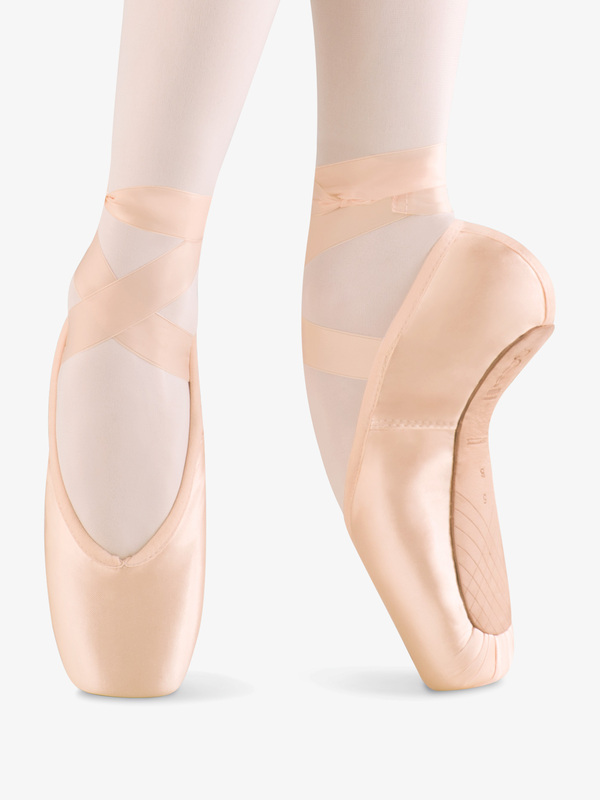 Sansha Adult Etudes Pointe Shoes S505: This is a great pointe shoe for beginners and professionals with its full medium strength shank and square wide box which provides better balance. Elastic is included. Suffolk Adult Solo Pointe Shoes SOLO: The Solo-inch by Suffolk has a medium profile, aligns the foot and assists the dancer to go en pointe. The strong, stable box has a lower vamp in the perfect U-shape. The elegant line of the shoe and slight taper of the box allows the shoe to mold to the dancer's foot. This shoe shank is available in light, standard, or hard. The standard shank is a 2mm board and the hard is a 2.5mm board. Please specify when ordering. Ribbons not included.Color: European Pink. Bloch Adult Balance European Pointe Shoes ES0160L: Bloch's Balance European-inch pointe shoe naturally contours the foot significantly improving injury prevention. The heel seam cushion reduces material creasing and maintains the perfect line of the foot when en pointe. The wide toe box provides a strong balancing platform. Other features include a low profile for the perfect continuation of the leg line and elastic binding for improved fit. Ribbons not included. Bloch Adult Balance European Pointe Shoes Hard Shank ES0160S: Bloch's Balance European-inch pointe shoe naturally contours the foot significantly improving injury prevention. 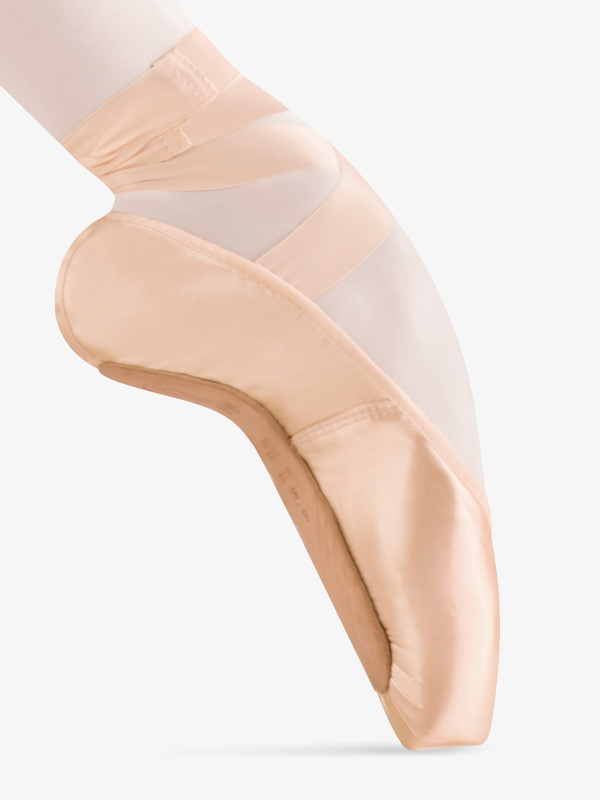 The heel seam cushion reduces material creasing and maintains the perfect line of the foot when on pointe. The wide toe box provides a strong balancing platform. Other features include a low profile for the perfect continuation of the leg line and elastic binding for improved fit. Hard shank. Ribbons not included. Bloch Adult B Morph Pointe Shoes ES0170L: Introducing the revolutionary pointe shoe, the B Morph. Developed by Bloch in conjunction with elite dancers from around the world, the B Morph is the fastest pointe shoe in the world to be broken in. The B Morph is moulded to perfection by the individual dancer by applying direct heat from a hair dryer to the parts of the shoe that the dancer wants to adjust. The special D Paste becomes pliable once heated, allowing the dancer to work the shoes to their liking by bending with their hands or walking gently around the studio. Once satisfied the dancer simply places the moulded shoes into their fridge over night and the paste will set hard like a new pair of shoes, ready for use, tailored to the individual dancers needs. The shoes can also be placed in the fridge after any heavy sessions so that they return to as new condition, prolonging the life of the shoes. Bloch Adult Amelie Pointe Shoes - Soft Shank S0102L: Bloch's Amelie-inch pointe shoe features gently curved sides on the box that encourage the foot into the correct alignment. 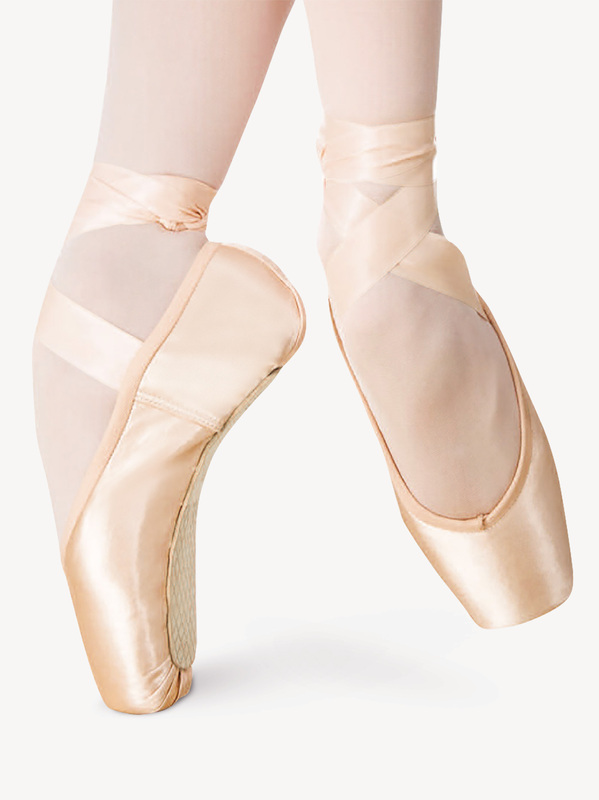 The shanks are graded in strength to allow the dancer to roll up onto pointe with ease. Bloch Adult Amelie Pointe Shoes - Medium Shank S0103L: Bloch's Amelie-inch pointe shoe features gently curved sides on the box that encourage the foot into the correct alignment. 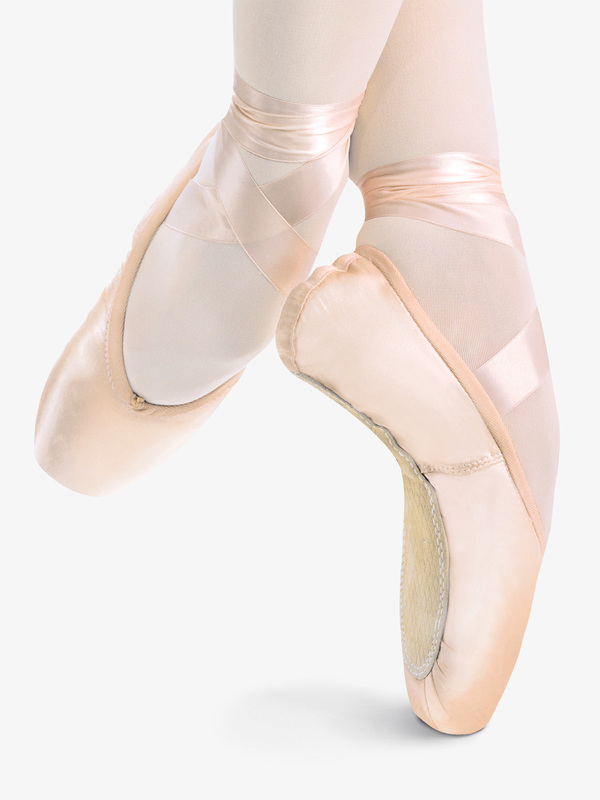 The shanks are graded in strength to allow the dancer to roll up onto pointe with ease. Bloch Adult Alpha Pointe Shoes S0104L: Designed for the more experienced dancer, Bloch's Alpha-inch pointe shoe features a skived 3/4 outsole design that allows maximum bend at the arch, without compromising support. The insole has been designed with a 2.5MM red board just above the outsole cut while a full-length top layer of leather board is placed to protect the arch tendons and muscles. Other features include a larger box with a generous platform for better balance, and a low noise pasting method similar to the Synergy, Aspiration, and Signature. Ribbons not included. Bloch Adult Aspiration Pointe Shoes S0105L: Bloch's Aspiration is built for students. 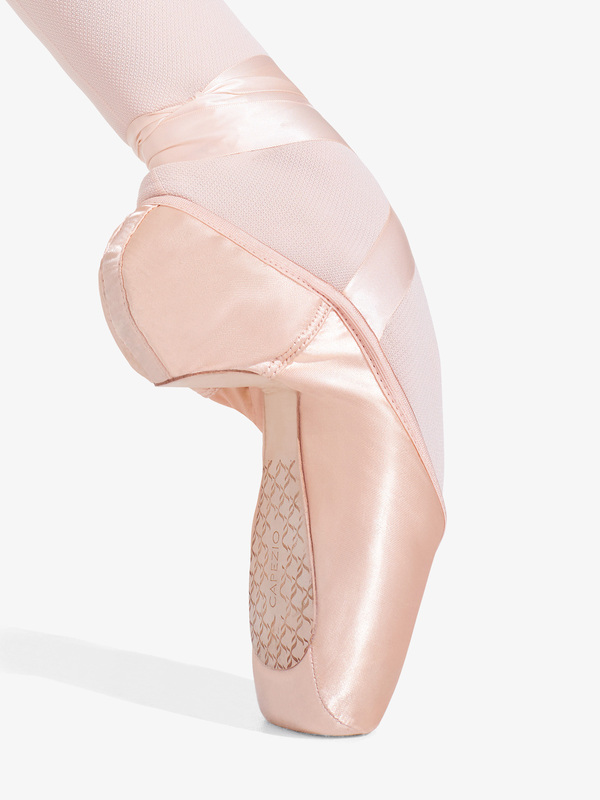 This pointe shoe features a harder, more supportive box that assists the beginner. Its full shank is designed to flex at the three-quarter-inch position. Ribbons not included. Bloch Adult Axiom Pointe Shoes S0108: Bloch's Axiom-inch pointe shoe is designed for beginners to professionals and features a U-shaped vamp, red board and leather board shanks and a padded heel counter. The low profile box height and pre-shaped sides provide more points of contact and the lower sides and angled seaming decreases bagginess and creasing. Available in Regular (3/4) or Hard shank.Ribbons not included. 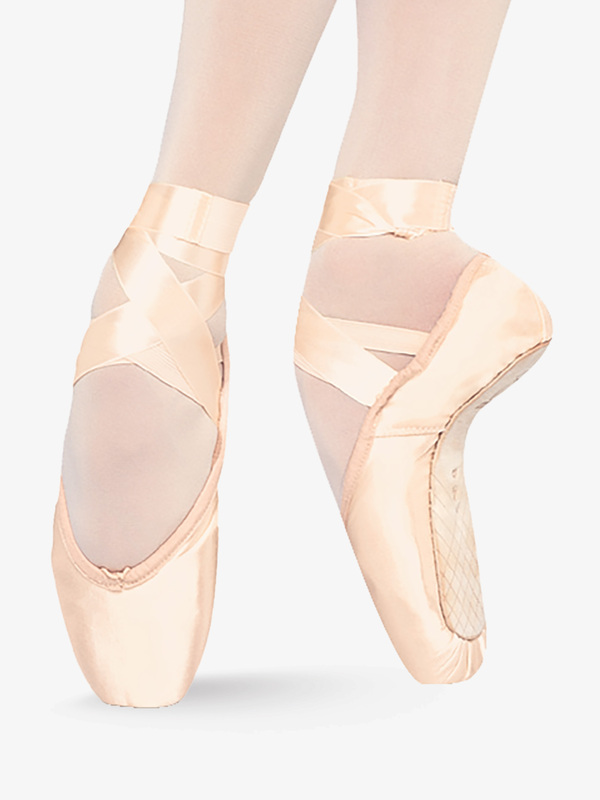 Capezio Womens Cambre Broad Toe #3 Shank Pointe Shoes 1126W: With its new and technically advanced design, the Cambre-inch pointe shoe will support you through those endless rehearsals and intensives. Shoe features a broad toe, a #3 shank, a lower crown, and a deep vamp. For added support, the Cambre-inch also features a full wing box, a sculpted arch, greater heel curve, and a plush, anti-slip sock lining. Elastic and ribbons sold separately. 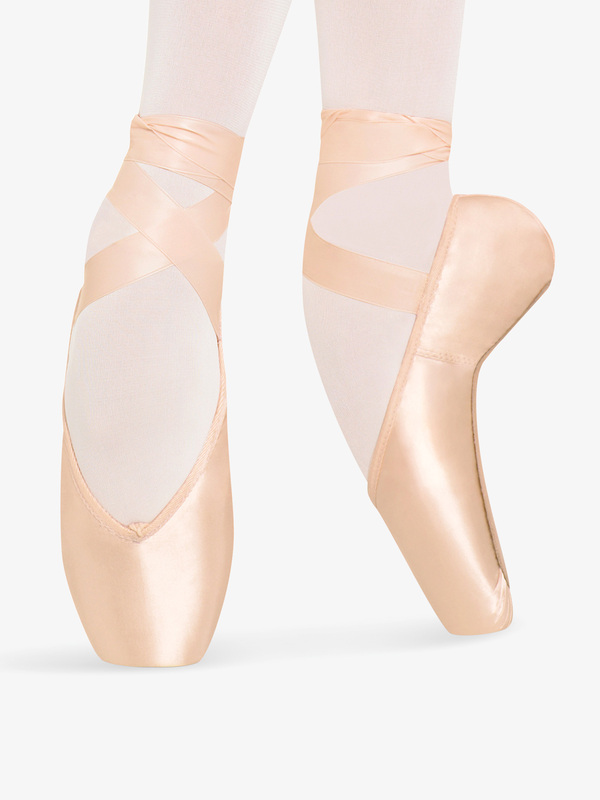 Capezio Womens Cambre Tapered Toe #3 Shank Pointe Shoes 1127W: With its new and technically advanced design, the Cambre-inch pointe shoe will support you through those endless rehearsals and intensives. Shoe features a tapered toe, a #3 shank, a lower crown, and a deep vamp. For added support, the Cambre-inch also features a full wing box, a sculpted arch, greater heel curve, and a plush, anti-slip sock lining. Elastic and ribbons sold separately. 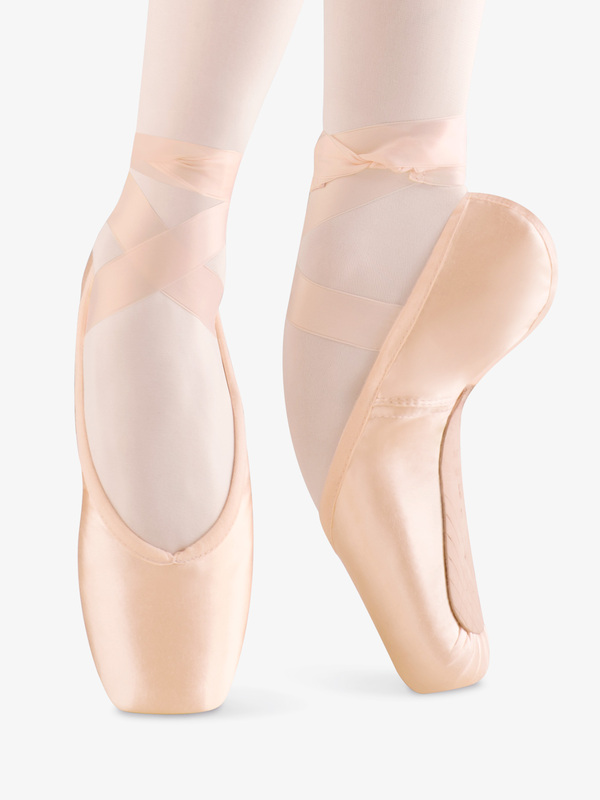 Capezio Womens Cambre Broad Toe #4 Shank Pointe Shoes 1128W: With its new and technically advanced design, the Cambre-inch pointe shoe will support you through those endless rehearsals and intensives. Shoe features a broad toe, a #4 shank, a lower crown, and a deep vamp. For added support, the Cambre-inch also features a full wing box, a sculpted arch, greater heel curve, and a plush, anti-slip sock lining. Elastic and ribbons sold separately. 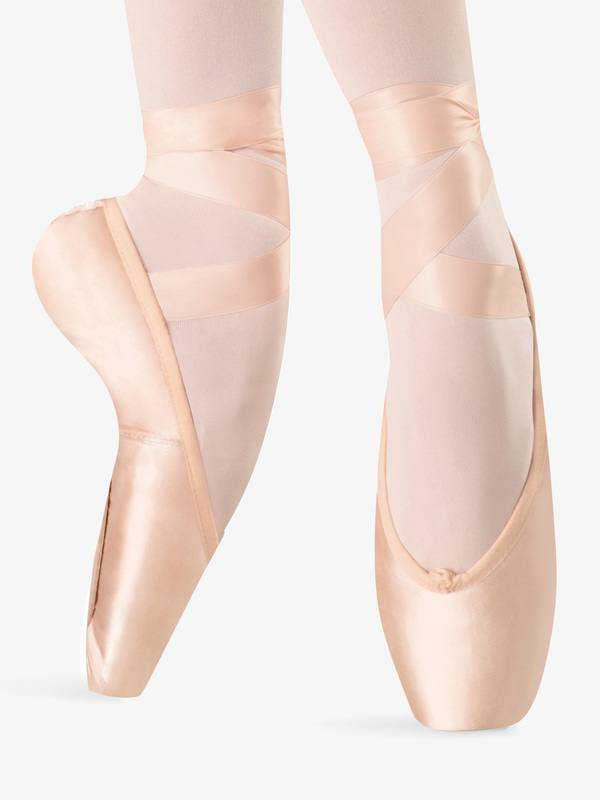 Capezio Womens Cambre Tapered Toe #4 Shank Pointe Shoes 1129W: With its new and technically advanced design, the Cambre-inch pointe shoe will support you through those endless rehearsals and intensives. Shoe features a tapered toe, a #4 shank, a lower crown, and a deep vamp. For added support, the Cambre-inch also features a full wing box, a sculpted arch, greater heel curve, and a plush, anti-slip sock lining. Elastic and ribbons sold separately. 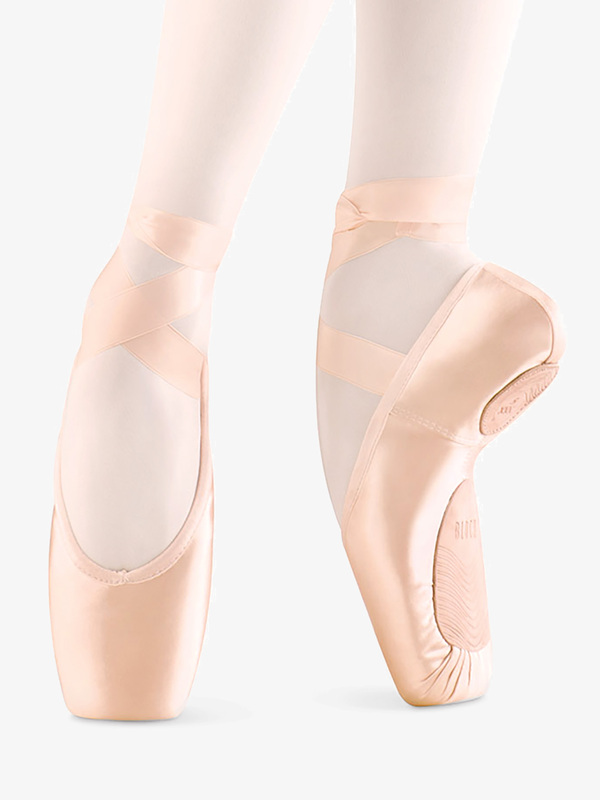 Capezio Womens Developpe #3 Shank Pointe Shoes 1136W: Finally, a pointe shoe that is designed to look beautiful on the foot and has all the support you need. The Developpe-inch features a #3 leather board shank that is half skived to zero, a moderate shape feathered toe box, a round shape throat, a medium vamp with low sides, and a wide, high platform. Shoe also features quiet toe construction, a hand-flattened crown, and a plush, anti-slip lining. Elastic and ribbons sold separately. Capezio Womens Developpe #5 Shank Pointe Shoes 1137W: Finally, a pointe shoe that is designed to look beautiful on the foot and has all the support you need. The Developpe-inch features a #5 leather board shank that is half skived to zero, a moderate shape feathered toe box, a round shape throat, a medium vamp with low sides, and a wide, high platform. Shoe also features quiet toe construction, a hand-flattened crown, and a plush, anti-slip lining. Elastic and ribbons sold separately. Merlet Womens Diva Suede Tip Pointe Shoes DIVA: A pair like these beautiful pointe shoes are perfect for any advanced or professional ballerina! 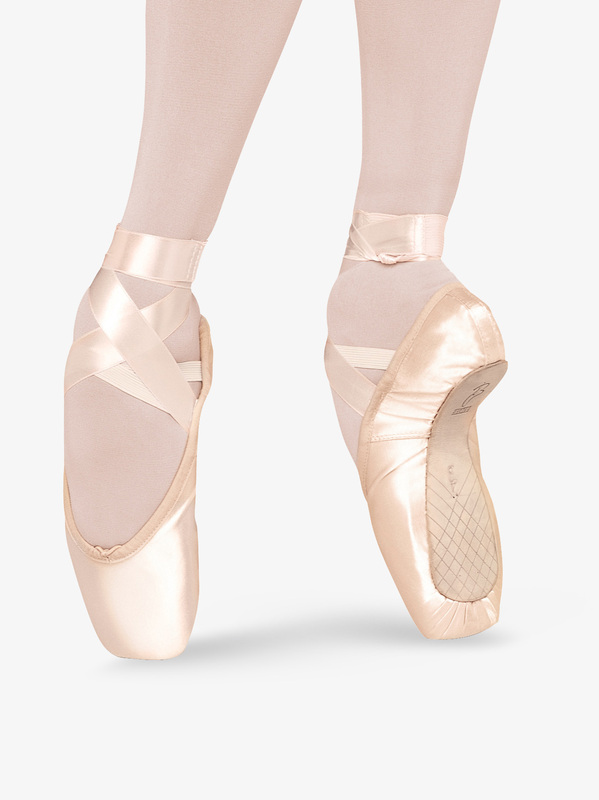 Traditionally-made this satin pointe shoe offers great stability and durability, medium sole, and 3/4 shank.Ribbon not included. Available in half sizes. 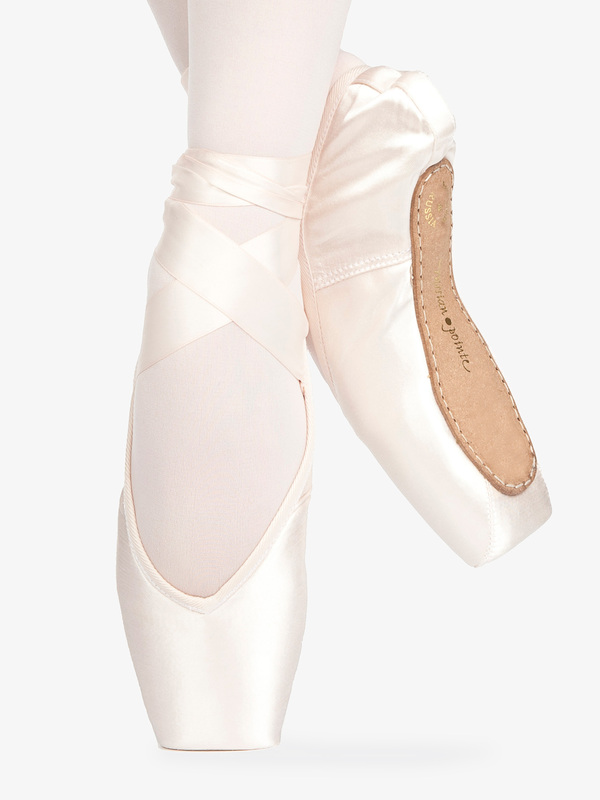 Merlet Womens Elista Canvas Pointe Shoes ELISTA: Dance smarter and longer in the Elista pointe shoes! Stretch canvas and elastane provide a comfortable fit, a flexible front and rear allow for complex movement, and the polycarbonate sole creates hours of additional wear. Sole is offered in medium or hard and comes in 3/4 or full shank. Recommended for medium levels. Ribbons not included.Available in half sizes. Mirella Adult Advanced Pointe Shoes MS101A: Mirella's Advanced-inch pointe shoe is a streamlined and light shoe with a short open U-shaped vamp and low cut sides revealing the instep. The gently curved suede outsole hugs the foot for greater articulation and support. The large platform provides greater control for ease of balancing and turning. Ribbons not included. Mirella Adult Academie Pointe Shoes MS101AC: Mirella's Academie is a beautiful light weight, comfortable and elegant pointe shoe. This beginner's style has a firm shank to provide support and resistance to the developing foot helping build foot and ankle strength. Ribbons not included. Bloch Adult Hannah Pointe Shoes S0109L: These best selling pointe shoes by Bloch are ideal for the ballet dancer looking to strengthen and build her foot. 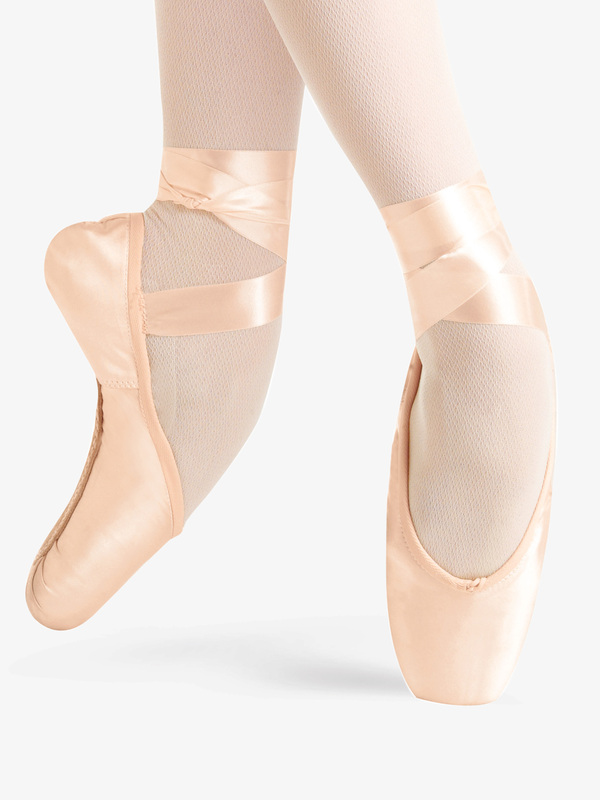 Lightweight pointe shoes feature a comfortable shape with internal contact points, a curved last, and a supple insole design. Provides the ultimate support with flexibility! Bloch Womens Hannah Strong Pointe Shoes S0109LS: One of Bloch's most popular designs, the Hannah Strong-inch pointe shoes, are built for strengthening and building. Shoes feature a strong shank, a wide yet tapered box that hits all major internal contact points, a supple insole designed on a curved last to support the foot en pointe, a cord drawstring, and Bloch's A Paste for increased longevity.Ribbons and elastic sold separately. Bloch Adult Jetstream S0129L: The Jetstream pointe shoe has been created with an innovative box design exclusive to Bloch. The new EVA cushioned box molds to the contours of the foot for greater comfort and shock absorbency eliminating the need for additional padding. Carefully tailored upper lining to reduce creasing. Low profile for a perfect continuation of the leg line. Bloch Adult Sonata Pointe Shoes S0130: Sonata-inch by Bloch is designed for beginners to professionals and features a high and wide toe platform. These shoes make the dancer feel lifted from the floor when on pointe. The arch support in this 3/4 skived shank shoe is felt right under the front section of the heel.Ribbons not included. Bloch Adult 'Serenade' Pointe Shoes S0131: Serenade-inch by Bloch offers a square, wide toe platform which is excellent for balance on pointe. It also provides superior lateral balance for the supporting foot when standing flat. Available in two shanks, Regular and Hard. Please specify when ordering.Ribbons not included. 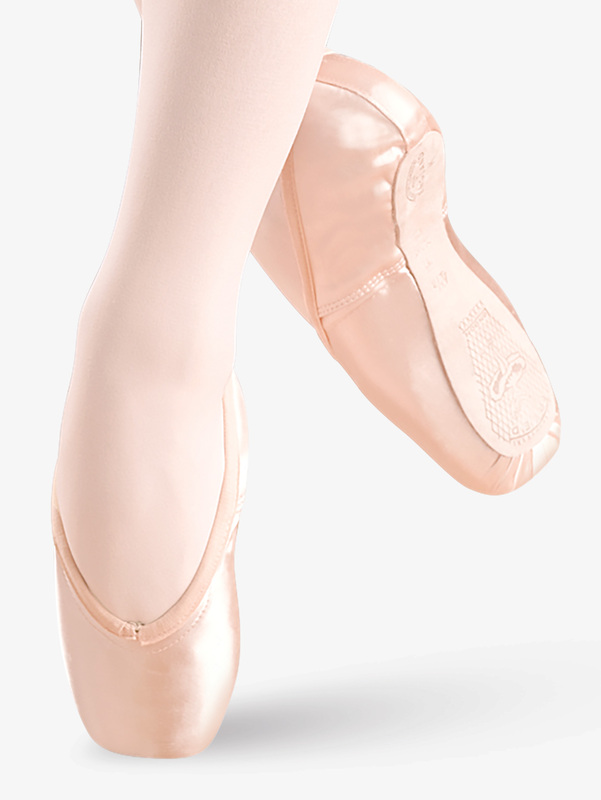 Bloch Adult Suprima Pointe Shoes S0132: Beginners through advanced students will feel comfortable in this Bloch shoe. Suprima-inch provides good flexibility through releve, yet retains good arch support. This shoe has a flattering appearance because of its excellent fit and tapered platform. Ribbons not included. Bloch Womens Tensus Demi Pointe Shoes S0155L: Get the support you are looking for as you transition towards pointe work. The Tensus-inch pointe shoes feature a leather outsole, a design more structured than a ballet flat, a last shape that supports the foot and creates a smooth surface, a square shaped box, low cut sides for an enhanced profile, and a narrow heel.Ribbons and elastic sold separately. 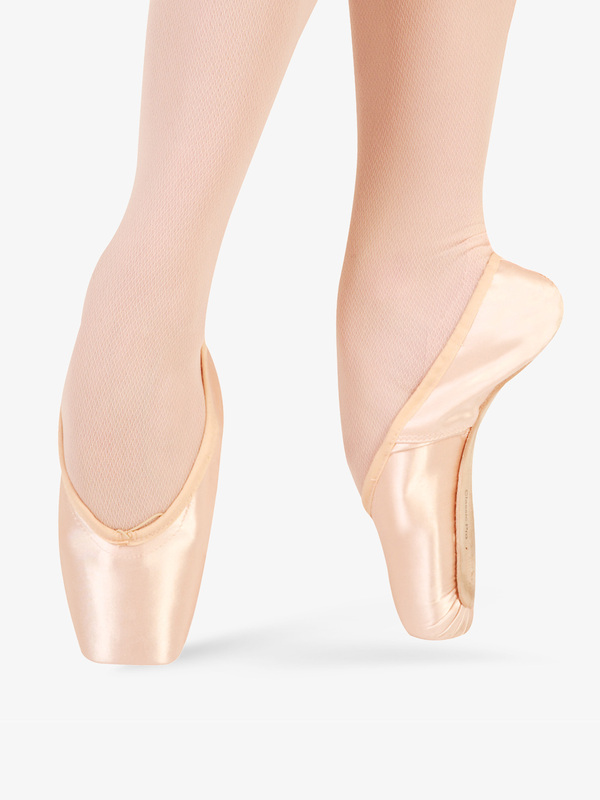 Bloch Adult EuroStretch Stretch Satin Pointe Shoes S0172L: The innovative EuroStretch-inch pointe shoes from Bloch feature the latest in stretch materials to allow proper articulation of the foot. 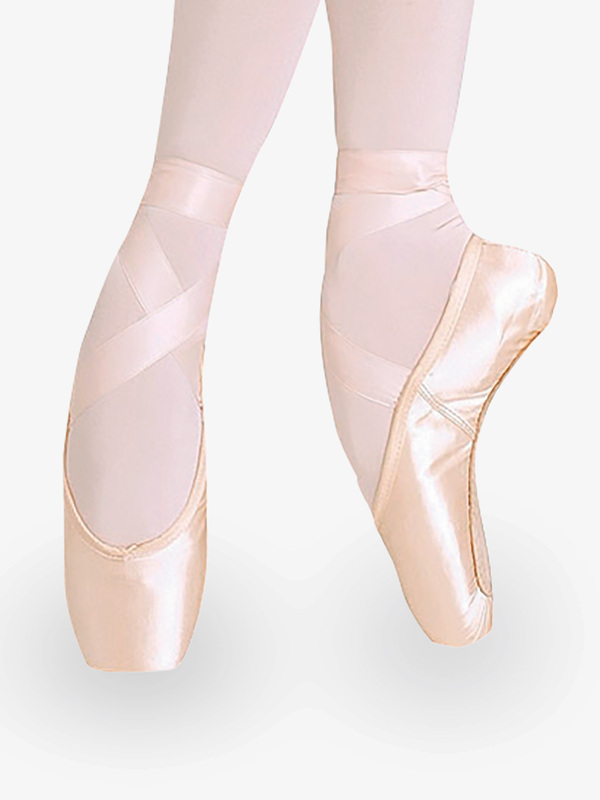 Ballet pointe shoes feature unique stretch satin, a split sole for maximum stretch at the arch, a firmer A Paste-inch pasting method to allow for a greater resistance to heat and humidity, a high and wide platform for better weight distribution, a low profile with an elastic drawstring, a leather grip heel, and a cotton insert for easier ribbon and elastic stitching. 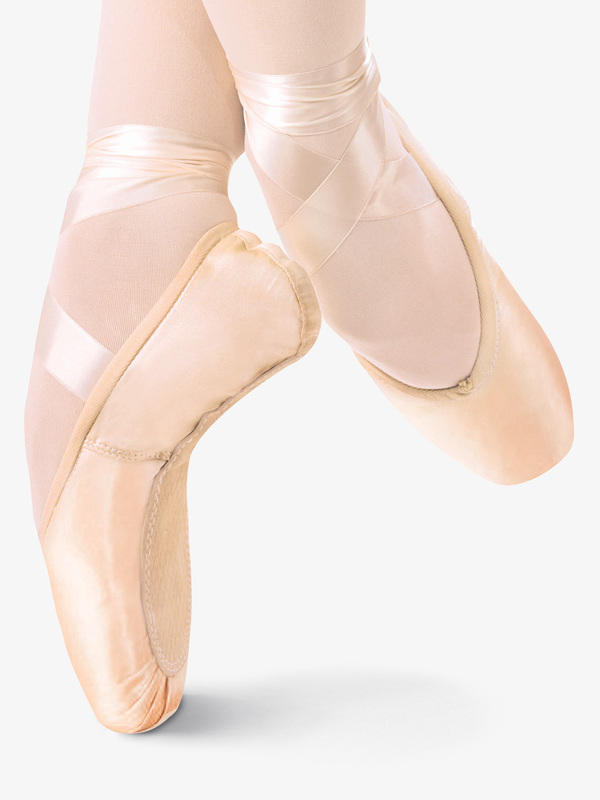 To properly protect the feet from injury, the dancer must be professionally fit for the Eurostretch Stretch Pointe Shoes. Bloch Womens Dramatica II Satin Pointe Shoes S01732L: With even more advancements, Bloch introduces the Dramatica II-inch pointe shoe, to provide you with the most innovative, and long-lasting support. Designed using Bloch's A paste, the longevity of the shoe is increased and correct placement is reinforced. 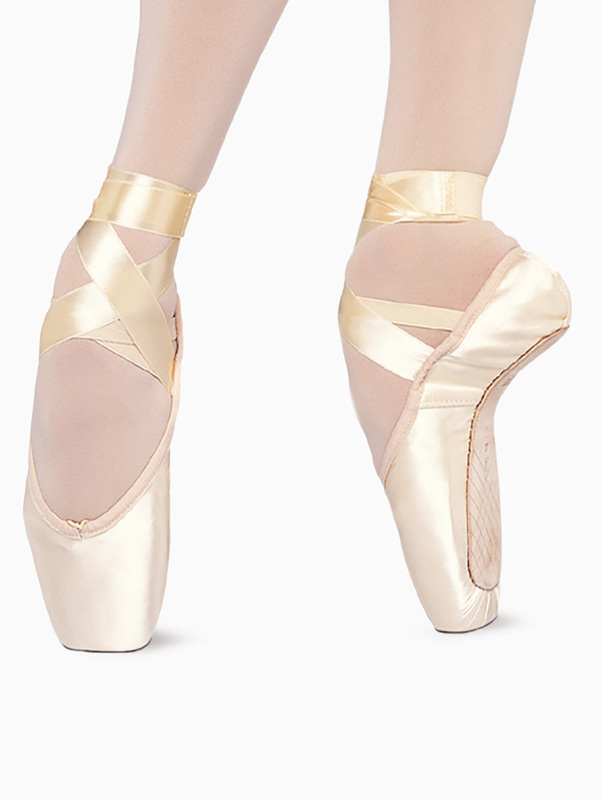 Pointe shoes also feature a slightly flatter crown for more contact, a reinforced box, a U-shaped vamp, and a low cut side that creates an enhanced profile. To avoid any slipping, the shoe is also designed with a leather grip at the heel and an elastic drawstring.Ribbons and elastic sold separately. Bloch Adult Heritage Pointe Shoes S0180L: Bloch's Heritage is a Russian inspired classical pointe shoe. This streamlined lightweight style features a V shape vamp and larger platform providing greater control en pointe for ease of balancing and turning with a medium strength. Ribbons not included. Bloch Womens Heritage Strong Pointe Shoes S0180S: Those endless hours of Swan Lake rehearsals are coming, so get the support you need with the Heritage Strong-inch pointe shoe. 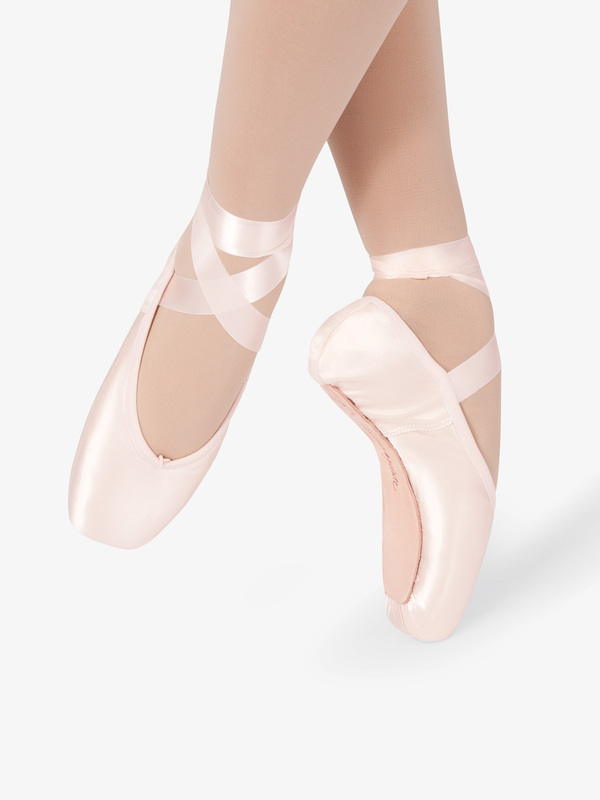 Offering all the attributes you are looking for, these pointe shoes feature a medium-strength, flexible shank that promotes foot articulation and can help dancers achieve demi pointe, flat pleating under the box for a smooth surface, a cupped heel shape for added security when standing or en pointe, and a plush, sponge cushion insert for the utmost comfort and protection.Ribbons and elastic not included. Bloch Adult Serenade MKII Pointe Shoes S2131L: Bloch's Serenade MKII-inch pointe shoe features a narrow heel and fits snugly. The platform is wider so it is better suited to a dancer with square shaped toes. This also helps lateral balance and assists dancers who are inclined to sickle-inch or fall off pointe sideways. Ribbons not included.Four improvements to the original Serenade: Streamlined satin upper. 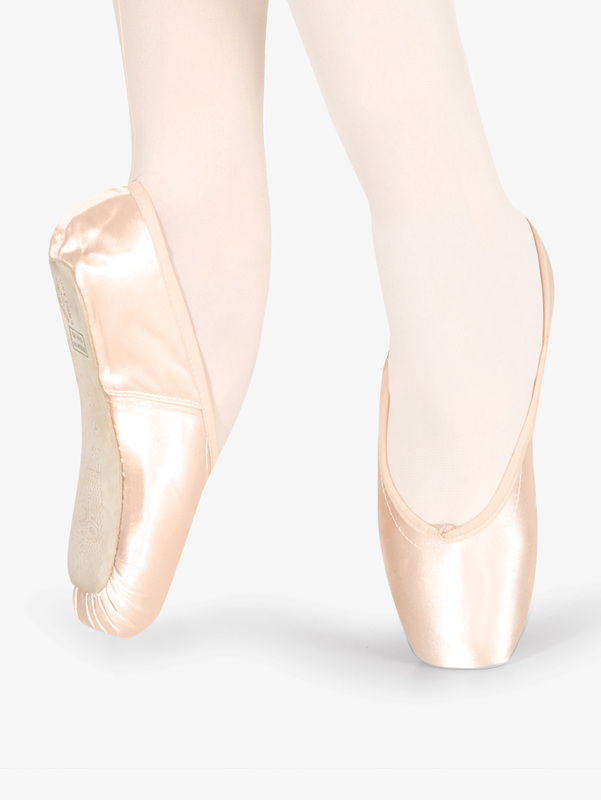 Sides of the satin upper have been lowered to reveal more of the dancers foot, enhancing aesthetic, providing a more modern, streamlined look as well as reducing bunching of satin when en pointe. New generation insole is virtually unbreakable creating harder wearing, longer life, better value for money, lighter, and molds quicker to the sole of a dancers arch giving greater support when en pointe. Also forces the shoe to sit flatter on stage, reducing rocking and enhancing stability. Longer wing puff. 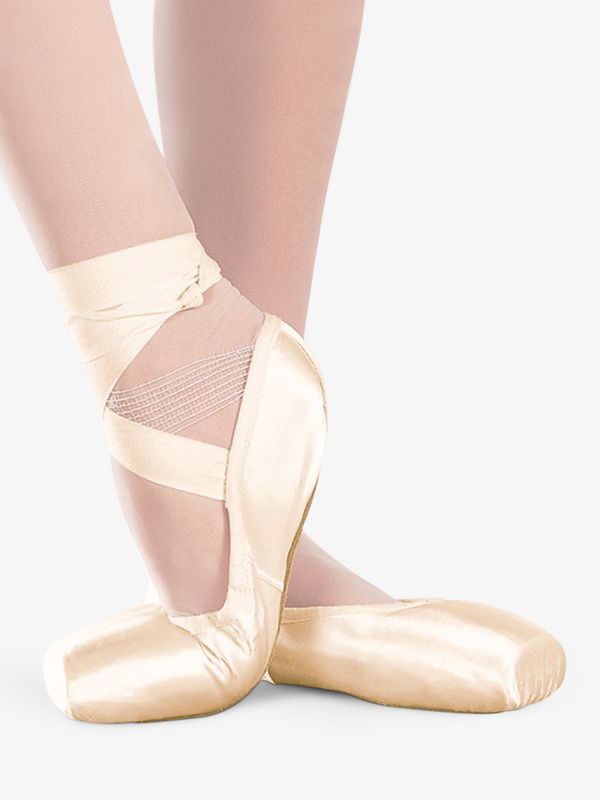 This reduces creasing and bunching of satin when en pointe. Additional padding under pleating makes these shoes quieter by cushioning impact on stage, reducing noise. Capezio Womens Ava Broad Toe Pointe Shoes 1142W: Providing additional structure and lateral support, the Ava-inch pointe shoes feature a broad square toe, low crown, narrow heel, full #2.5 board/red board combination shank, medium vamp, slight U-inch shape throat, and plush anti-slip interior lining. Ribbons not included. 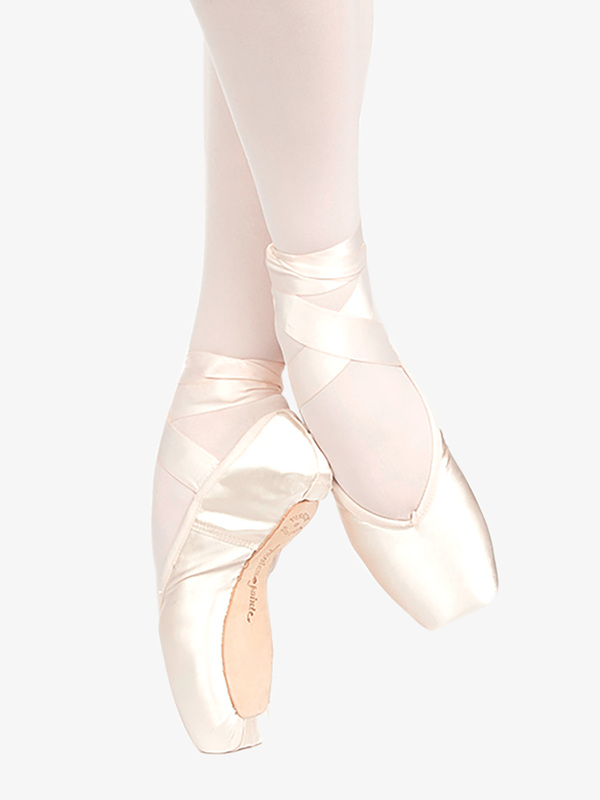 Chacott Adult Veronese II Pointe Shoes VER: Chacott's Veronese II-inch pointe shoes are made in Japan. They have very little gap between toe and vamp for better support and molding wingless box molds quickly to the foot. This lightweight tapered V-shaped shoe has minimal break-in time. Available in two shanks, Medium or Hard. Please specify when ordering.Ribbons included. 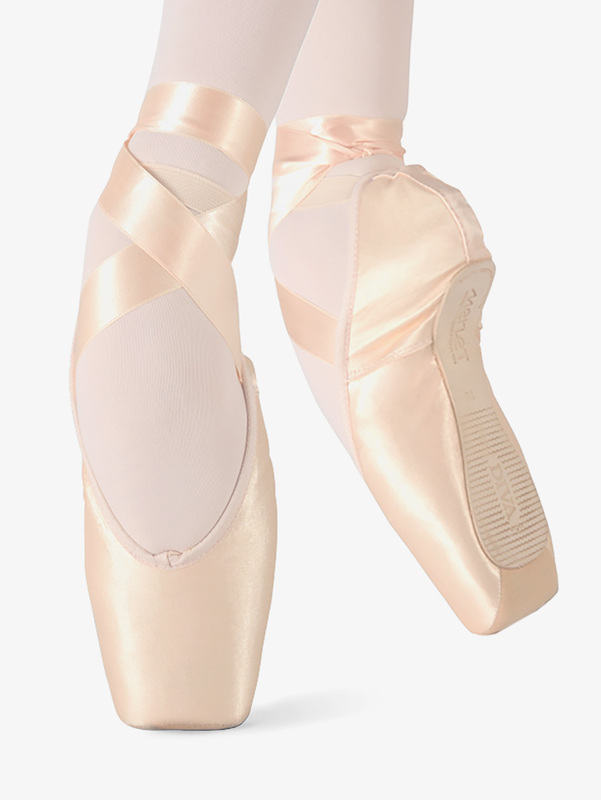 Freed Adult Classic Pointe Shoes SBT102: Freed's legendary and best selling classic design stresses quietness and a balance between strength and lightness. All Freed pointe shoes are hand lasted by Freed of London Point Shoe Makers and feature natural and biodegradable components, a regular strength insole, a deep round cut vamp with a standard weight block, a naturally angled platform with straight cut sides, and a cotton drawstring. Standard strength gives support, while enabling the fluid and quiet movement of the floor, ideal for any level dancer. We stock deep vamp only. No maker-inch requests please. Ribbons not included. 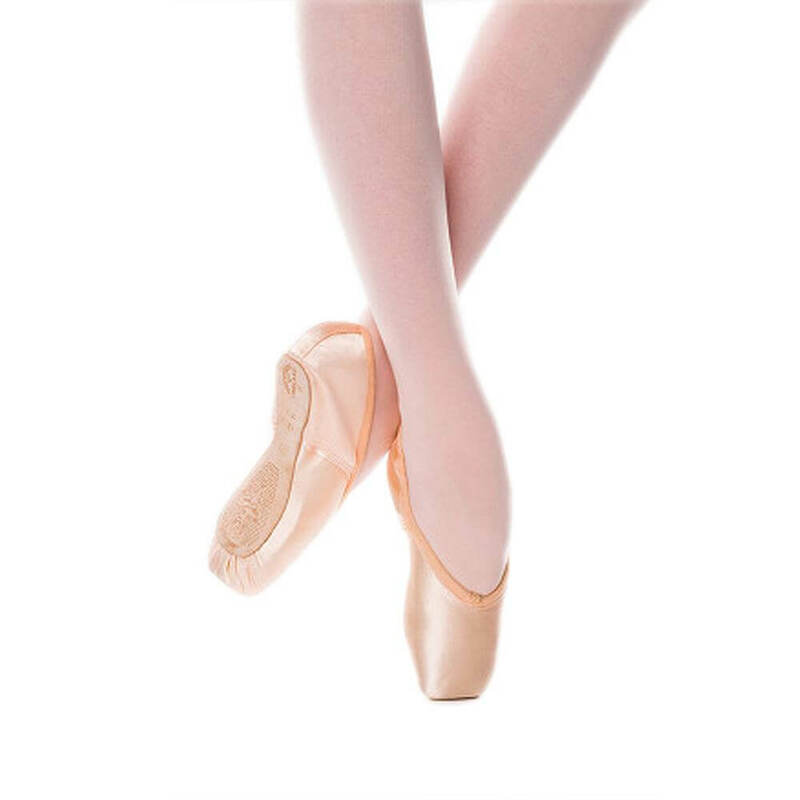 Freed Adult Classic Professional Medium Pointe Shoes SBTCP: Freed's Classic Professional-inch 3/4 shank pointe shoe features a pitched and angled platform for optimal placement and balance, as well as a medium shank. Features a graduated insole design that is strong under the metatarsal and flexible under the heel, an extra deep vamp cut to a slight V shape, and a light wing block. Other features include a flexible demi-pointe, an elastic drawstring, a contoured side, lower back measurements, and a long vamp and stronger box made from biodegradable material creating extended durability. 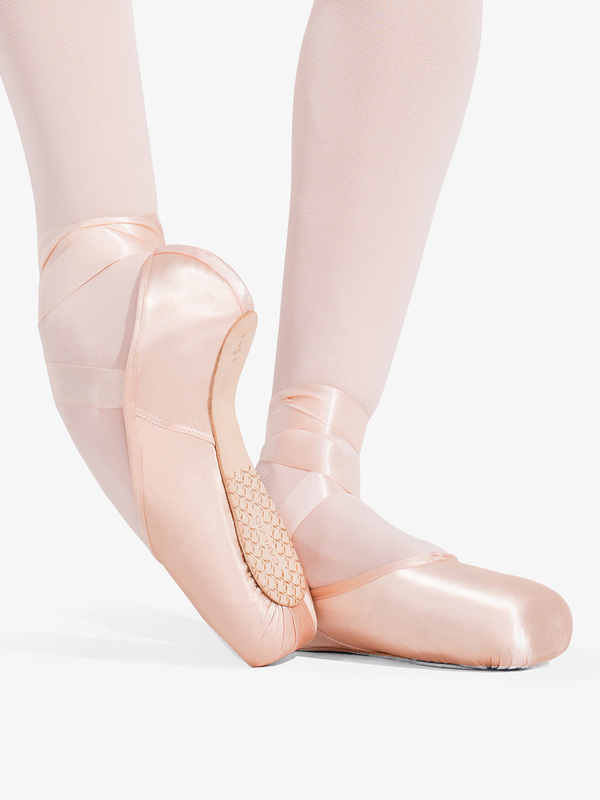 Suitable for experienced pointe work students, who require a more technical shoe. Ribbons not included. Freed Classic Professional 90 Pointe Shoes SBTCP90: Perfect for the dancer who has completed their basic pointe work training as well as the more experienced dancer. 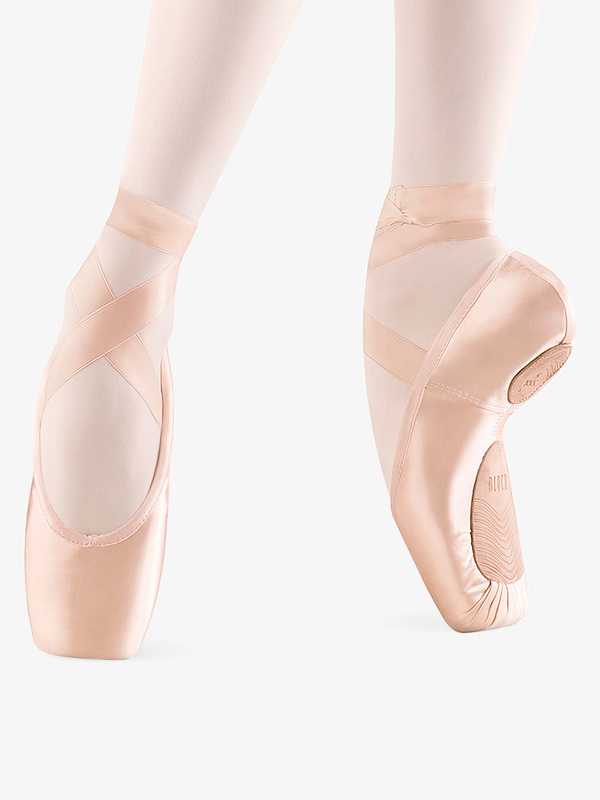 Freed's Classic Professional 90 Pointe Shoe is made with a platform that is angled to 90 degrees to position the dancer stability and centrally en pointe. Features Freed's Classic Pro Insole with a graduated design that is strong under the metatarsal and flexible under the heel. Also features a medium shank, an extra deep round cut vamp, a light wing block, a strong block and platform, low cut sides, and an elastic drawstring. Hand lasted by Freed of London pointe shoe makers with natural and biodegradable products. Ribbons not included. 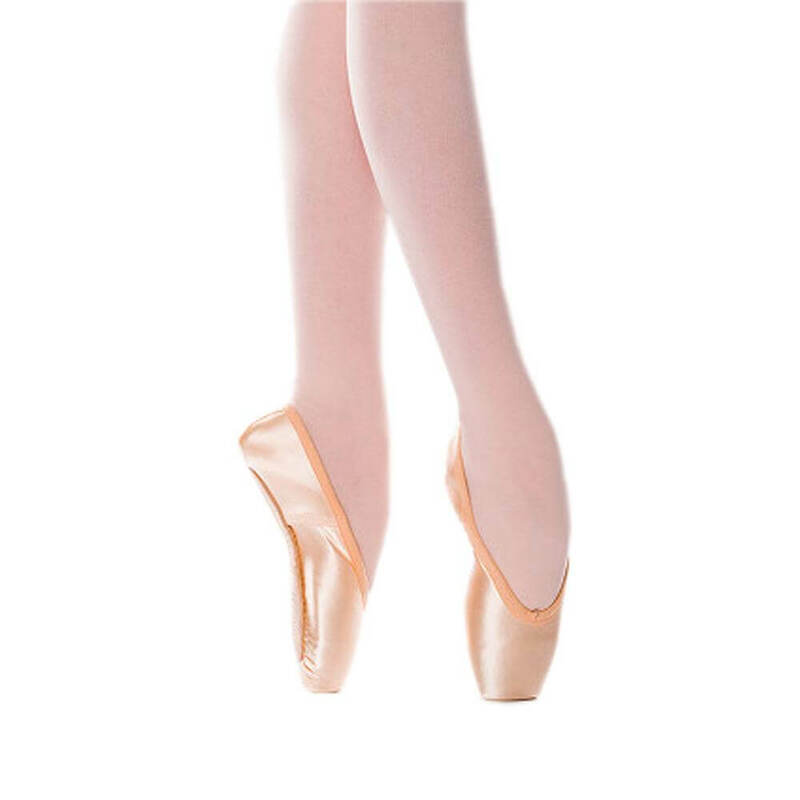 Freed Adult Classic Professional Hard Pointe Shoes SBTCPH: Freed's Classic Professional-inch 3/4 shank pointe shoe features a pitched and angled platform for optimal placement and balance, as well as a medium shank. Features a graduated insole design that is extra strong under the metatarsal and flexible under the heel, an extra deep vamp cut to a slight V-shape, and a light wing block. Other features include an elastic drawstring, a contoured side, lower back measurements, and a long vamp and stronger box made from biodegradable material creating extended durability. Enables the dancer to feel supported while also presenting the curve of the instep. 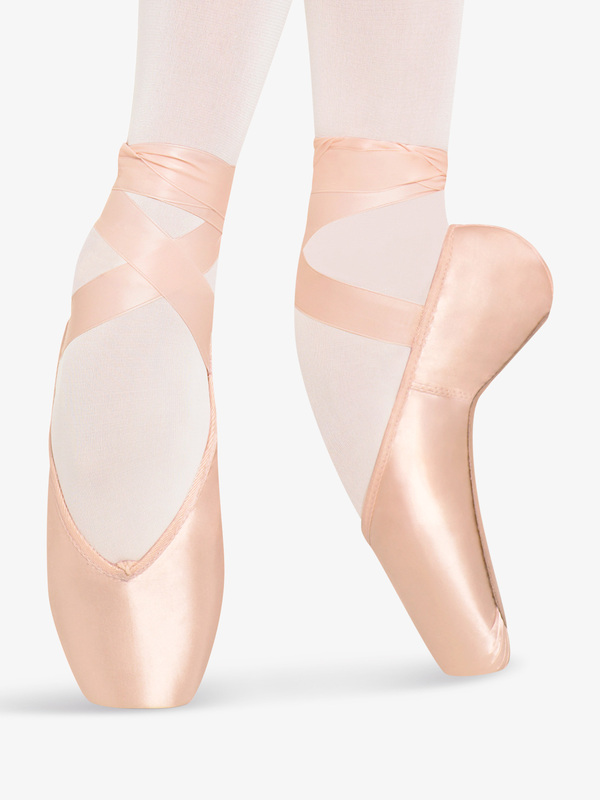 Worn by intermediate and advanced level dancers who require more support and durability from a pointe shoe. 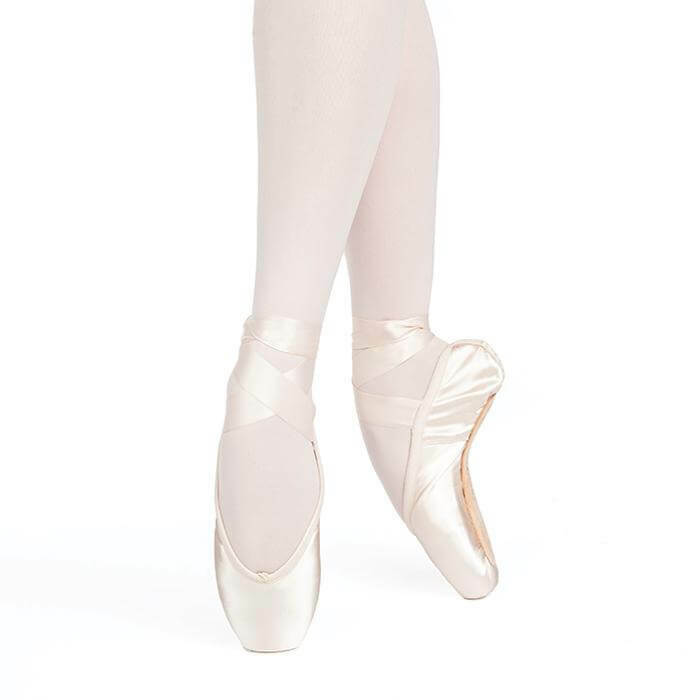 Freed Adult Wing Block Pointe Shoes SBTWB: For those who require a little more of their shoe, this Freed model incorporates a WING BLOCK-inch for support and smoothness of line, and a deep v-cut vamp to lend support to the metatarsal. Other features include a strong block, a medium strong insole, a deep vamp, a naturally angled platform, straight cut sides, and a cotton drawstring. Hand lasted by Freed of London Pointe Shoe Makers and constructed entirely from natural and biodegradable components. Often chosen by students as their second pair of shoes and used right up to professional levels. Ribbons not included. 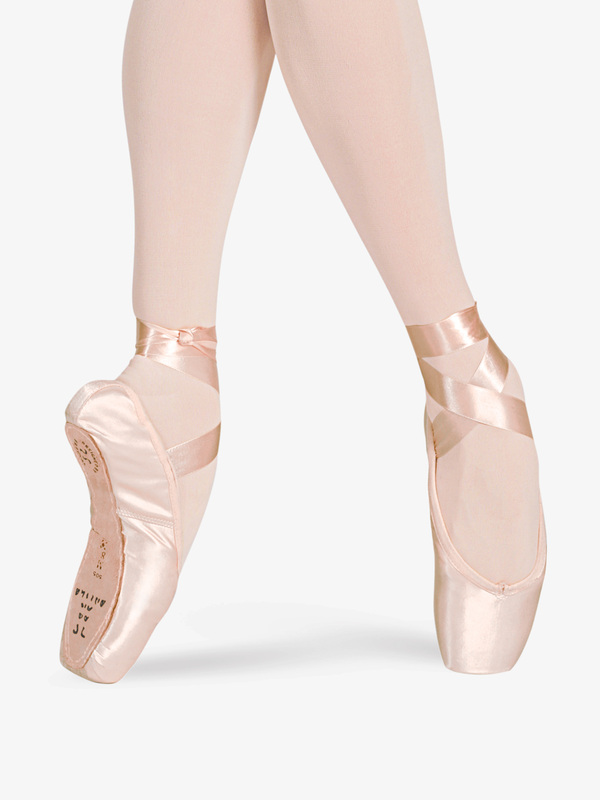 Freed Adult Studio Pointe Shoes STU: Freed's Studio-inch pointe shoe is available in Medium or Hard shanks. Features include a deep v-cut vamp, a very strong supportive block, a strong Wing block, a tapered platform for an elegant line, slightly dipped sides, and a cotton drawstring. Technically manufactured in the Freed of London Factory with entirely natural biodegradable components. This internationally popular shoe is worn by the experienced student through to the performance level. Ribbons not included. 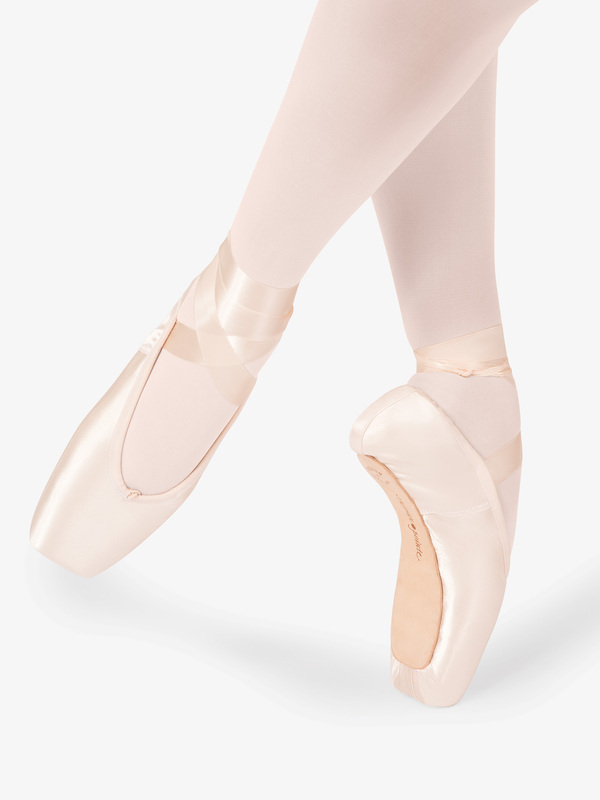 Freed Adult Studio II Pointe Shoes STUII: Freed's Studio II-inch contains all the features of the Studio,-inch but with a wider platform and a slightly flatter profile. Available in Medium or Hard shanks. Features include a deep vamp cut to a V, a very strong supportive block, a strong Wing block, a wide platform for an elegant line angled on to pointe, slightly dipped sides, and a cotton drawstring. Technically manufactured in the Freed of London Factory with entirely natural and biodegradable components. An Internationally popular shoe that is worn by the experienced student through to the performance level. Ribbons not included. 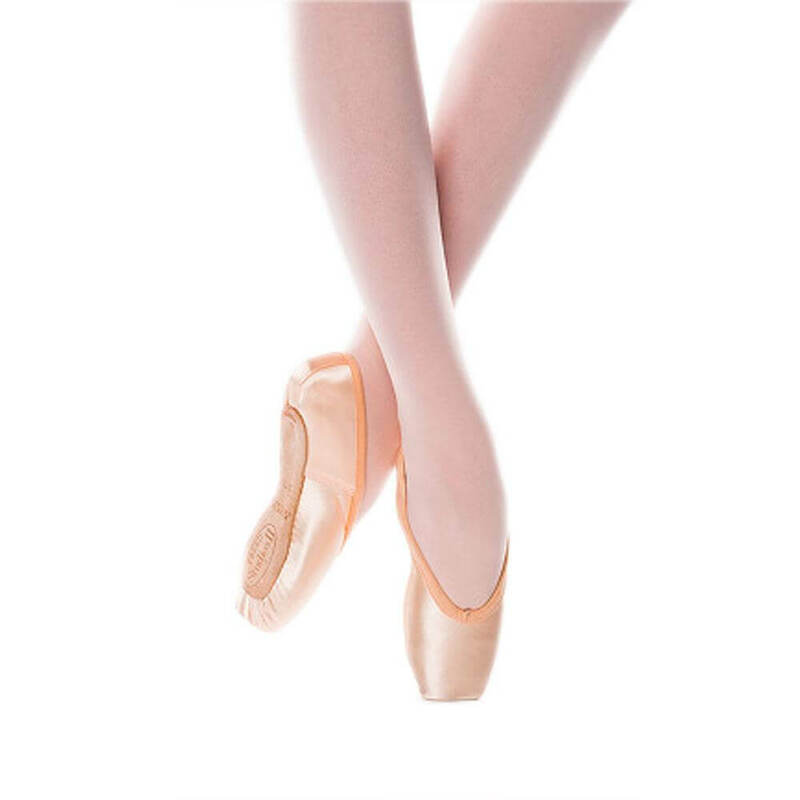 Freed Adult Studio Professional Pointe Shoes STUXV: Freed's Studio Professional-inch offers maximum support and comfort to meet the requirements of today's high-level pointe work. Perfect for the more advanced dancer, this shoe offers a deep cut vamp, a strong supportive block, an internal absorbing component in the platform to diffuse stress, a strong Wing block, a tapered platform, dipped sides, and elastic drawstrings. Technically manufactured in the Freed of London factory with natural and biodegradable components. Worn by intermediate students and professional dancers with great success. Ribbons not included. 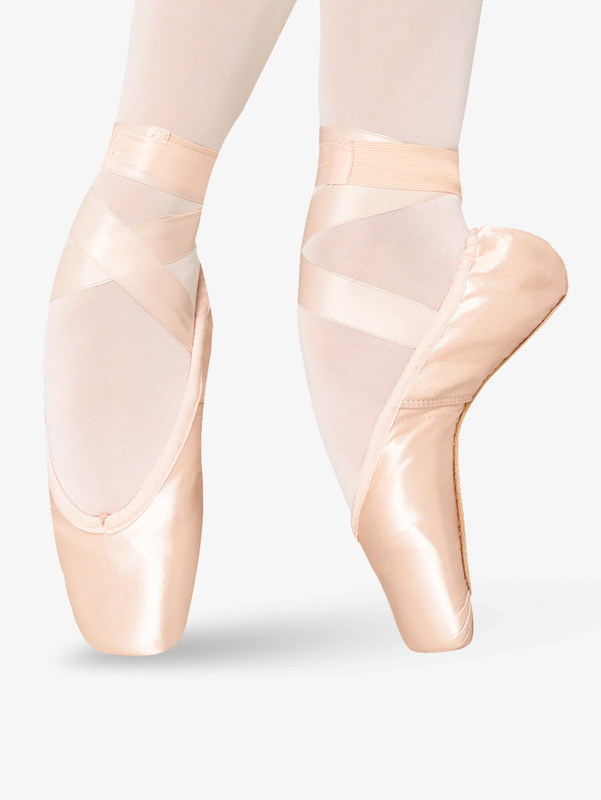 Grishko Adult Fouette ProFlex Pointe Shoes FPF: Grishko's Fouette ProFlex integrates two innovative technologies: Pro for silence on stage, and Flex to hug the arch, ease break-in, and enhance roll-through. 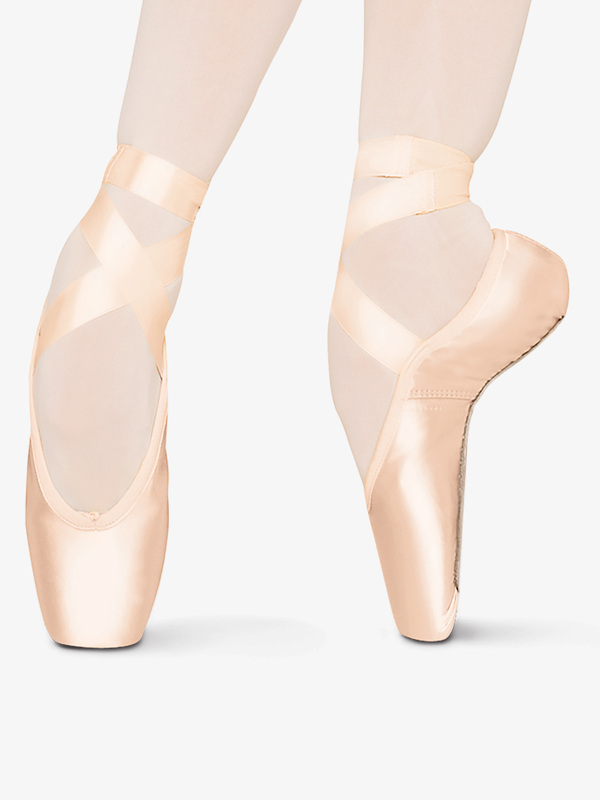 Fouette ProFlex has a supportive slightly tapered box, medium platform, full-length shank, and medium-height V-shaped vamp. Leather sole, cotton drawstring.Grishko pointe shoes are made in Moscow, Russia, by expert cobblers who craft each shoe individually by hand, using natural, non-toxic materials. The company designs its shoes based on in-depth study of anatomy and function, to best ensure superb performance and protect dancers' health and safety on pointe. Grishko's attention to detail includes balancing each shoe by hand; using cotton drawstrings to protect against tendonitis over-tightened elastic can cause; using glues that help the toe box mold beautifully to the foot; maintaining shank mobility at the heel without sacrificing support; designing both platforms and soles to be flat and stable for excellent balance on and off pointe; and selecting only the finest satin for a beautiful appearance. 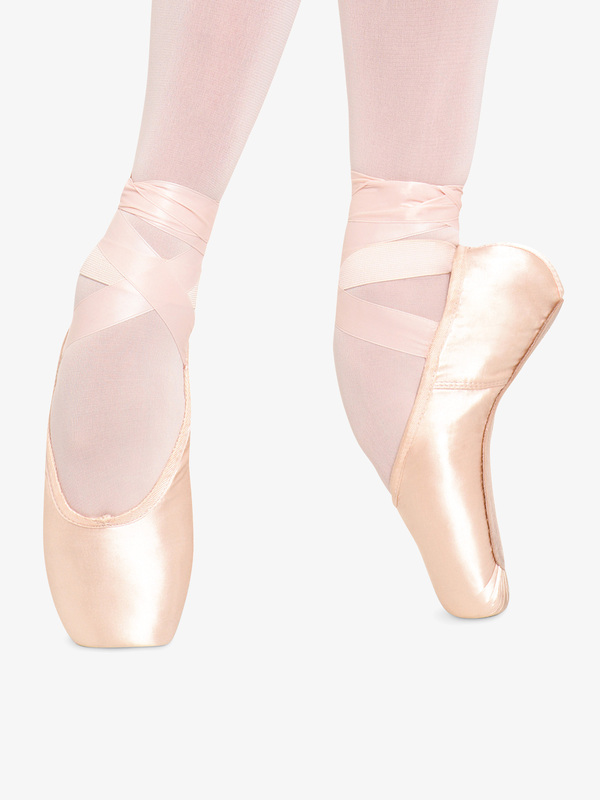 Grishko pointe shoes are considered reliable, durable and consistent.Available in Medium and Hard shanks. Please specify shank when ordering. Ribbons not included. 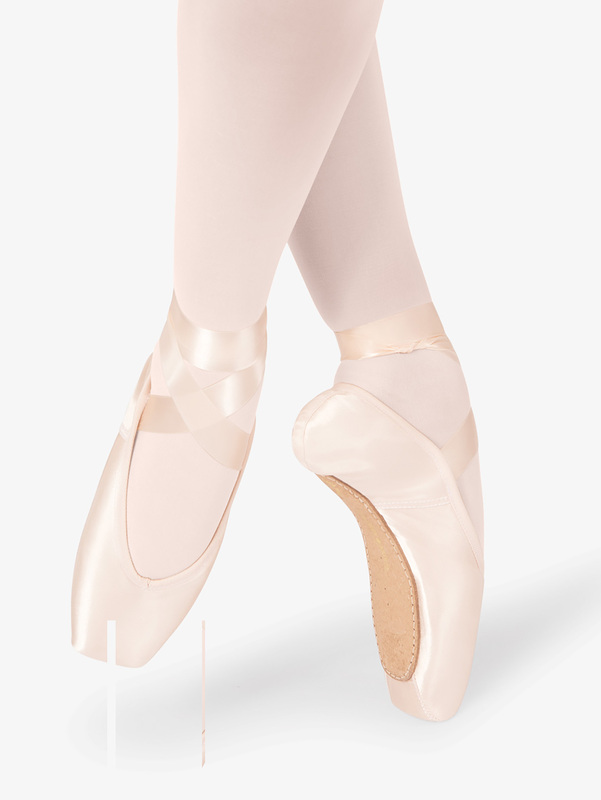 Grishko Adult Maya Pointe Shoes MAYA: Grishko's Maya is a lightweight model with a 3/4-length shank with Grishko's roll-through design, and lighter box wings for enhanced flexibility and comfort. Created on the same last as Fouette, Maya features a medium-height V-shaped vamp, medium platform and slightly tapered box. Suede sole, cotton drawstring.Grishko pointe shoes are made in Moscow, Russia, by expert cobblers who craft each shoe individually by hand, using natural, non-toxic materials. The company designs its shoes based on in-depth study of anatomy and function, to best ensure superb performance and protect dancers' health and safety on pointe. Grishko's attention to detail includes balancing each shoe by hand; using cotton drawstrings to protect against tendonitis over-tightened elastic can cause; using glues that help the toe box mold beautifully to the foot; maintaining shank mobility at the heel without sacrificing support; designing both platforms and soles to be flat and stable for excellent balance on and off pointe; and selecting only the finest satin for a beautiful appearance. 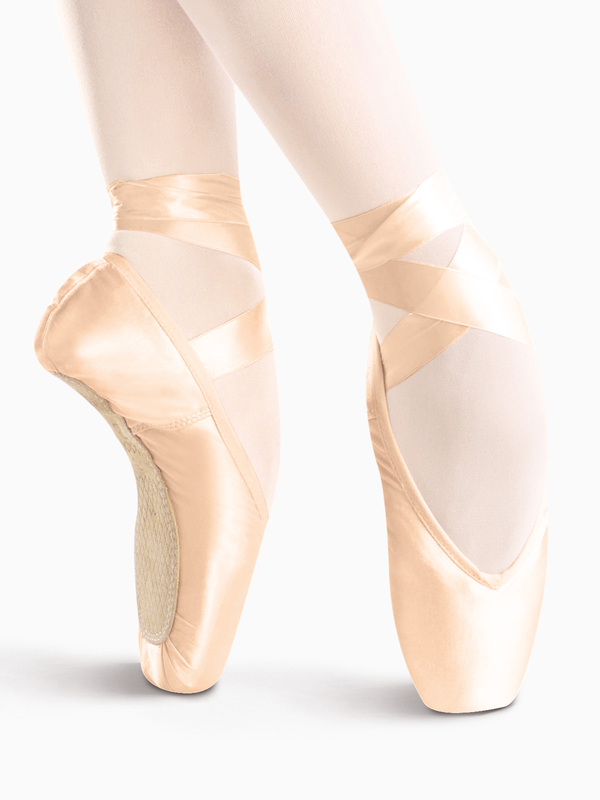 Grishko pointe shoes are considered reliable, durable and consistent. Available in Medium or Hard shanks; please specify when ordering. Ribbons not included.Color: Light European Pink Satin. 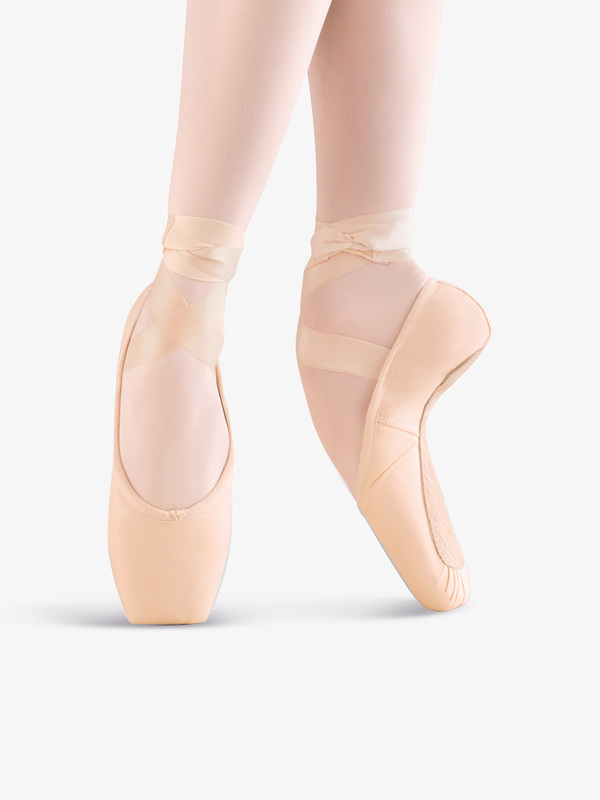 Grishko Adult Nova Pointe Shoes NOVA: This pointe shoe features a U-shaped medium vamp, a wider platform for balance, longer flexible side wings for support, a double upper for stability and special material on the toe for a quieter sound. Similar to Grishko's 2007 pointe shoe, except the Nova's heel is 5mm lower making it great for dancers with a disappearing heel. Excellent for both beginners and advanced dancers. 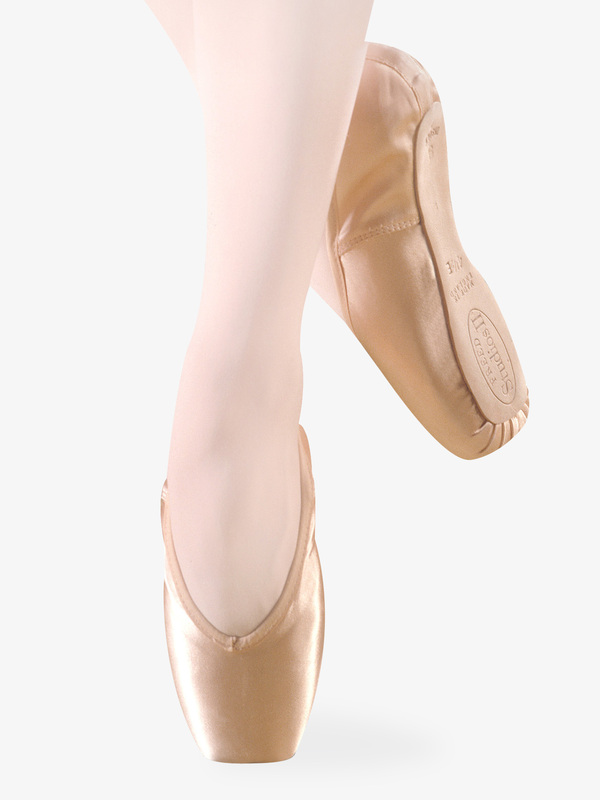 Grishko Adult Pro Quiet 2007 Pointe Shoes P2007: Created to be silent on stage, Grishko's Pro 2007 is made on the popular 2007 last, with an added noise-reducing strip on the platform and pleats, and special glue for extra box elasticity. 2007 models fit a remarkable variety of feet, with an anatomical form designed to relieve pressure on the big toe joint, based on targeted studies of foot shape and pointework dynamics. Pro 2007 is lightweight, supportive and comfortable, with a somewhat tapered box and medium platform, supportive yet non-constrictive medium-height U-shaped vamp, and 3/4-length shank with Grishko's roll-through design. Shank: Super Soft, Medium, Hard (specify when ordering). Suede sole; cotton drawstring; ribbons not included. Grishko pointe shoes are made in Moscow, Russia, by expert cobblers who craft each shoe individually by hand, using natural, non-toxic materials. The company designs its shoes based on in-depth study of anatomy and function, to best ensure superb performance and protect dancers' health and safety on pointe. 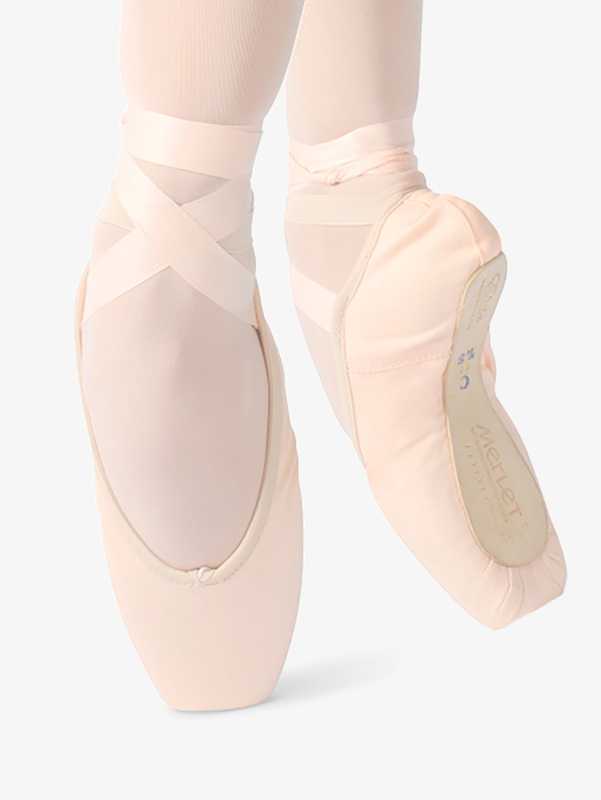 Grishko's attention to detail includes balancing each shoe by hand; using cotton drawstrings to protect against tendonitis over-tightened elastic can cause; using glues that help the toe box mold beautifully to the foot; maintaining shank mobility at the heel without sacrificing support; designing both platforms and soles to be flat and stable for excellent balance on and off pointe; and selecting only the finest satin for a beautiful appearance. 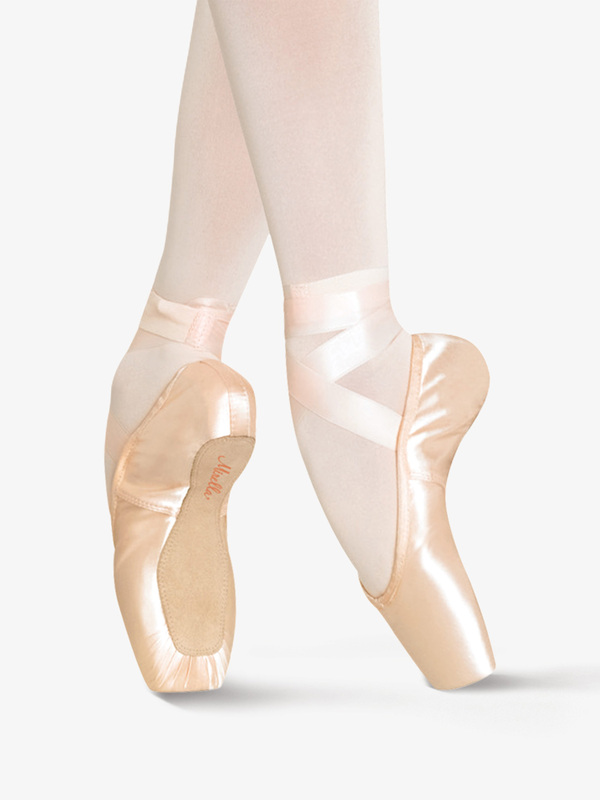 Grishko pointe shoes are considered reliable, durable and consistent. Grishko Adult Triumph Pointe Shoes TRS: Grishko's Triumph pointe shoe was created based on the customizations most requested by world-famous ballerinas, with a broad platform, handmade, extra-flat sole of special anti-slip leather, lower heel fabric, and 3/4-length shank with Grishko's roll-through design. Triumph is lightweight and supportive, with a medium-height U-shaped vamp and very slightly tapered box. Shank: Soft, Medium, Hard. Please specify when ordering. Leather sole; cotton drawstring; ribbons not included. 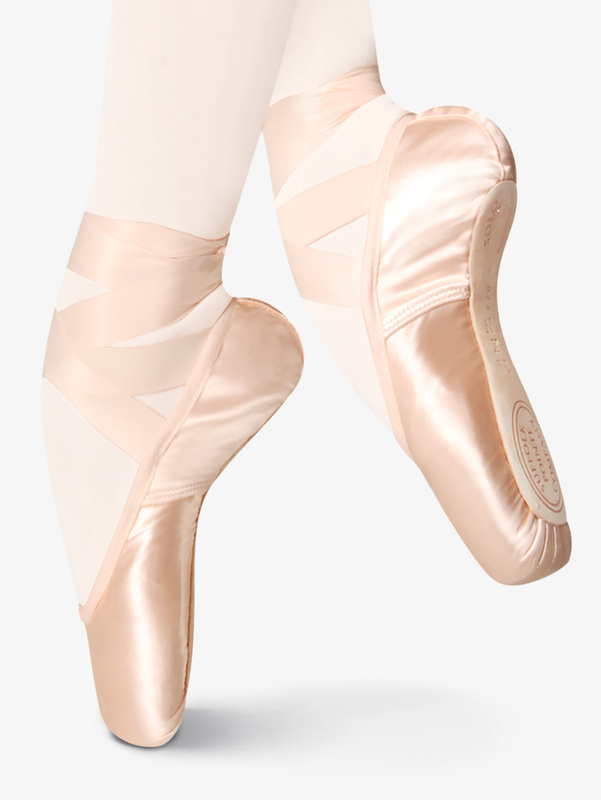 Grishko Adult Ulanova Pointe Shoes ULAI: Grishko's Ulanova I is created on the same last as Fouette, and features a supportive slightly tapered box, medium platform, medium-height V-shaped vamp, and full-length shank with Grishko's roll-through design. Leather sole, cotton drawstring.Grishko pointe shoes are made in Moscow, Russia, by expert cobblers who craft each shoe individually by hand, using natural, non-toxic materials. 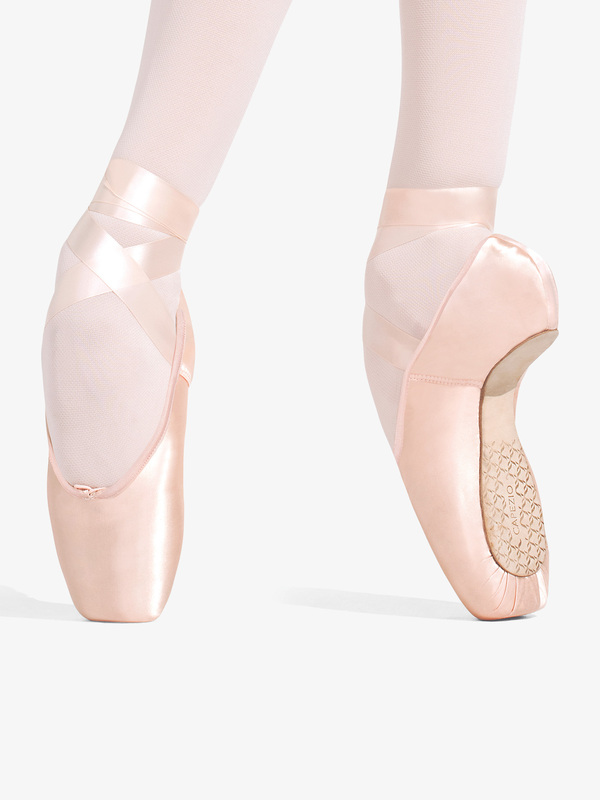 The company designs its shoes based on in-depth study of anatomy and function, to best ensure superb performance and protect dancers' health and safety on pointe. Grishko's attention to detail includes balancing each shoe by hand; using cotton drawstrings to protect against tendonitis over-tightened elastic can cause; using glues that help the toe box mold beautifully to the foot; maintaining shank mobility at the heel without sacrificing support; designing both platforms and soles to be flat and stable for excellent balance on and off pointe; and selecting only the finest satin for a beautiful appearance. 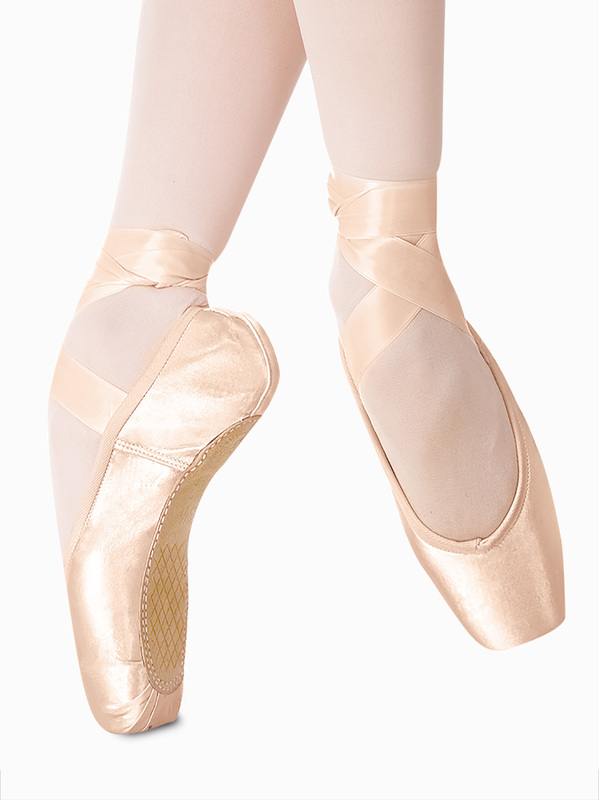 Grishko pointe shoes are considered reliable, durable and consistent. Available in Medium or Hard shanks. Please specify when ordering. Now comes with drawstring. Ribbons not included.Color: Light European Pink Satin. 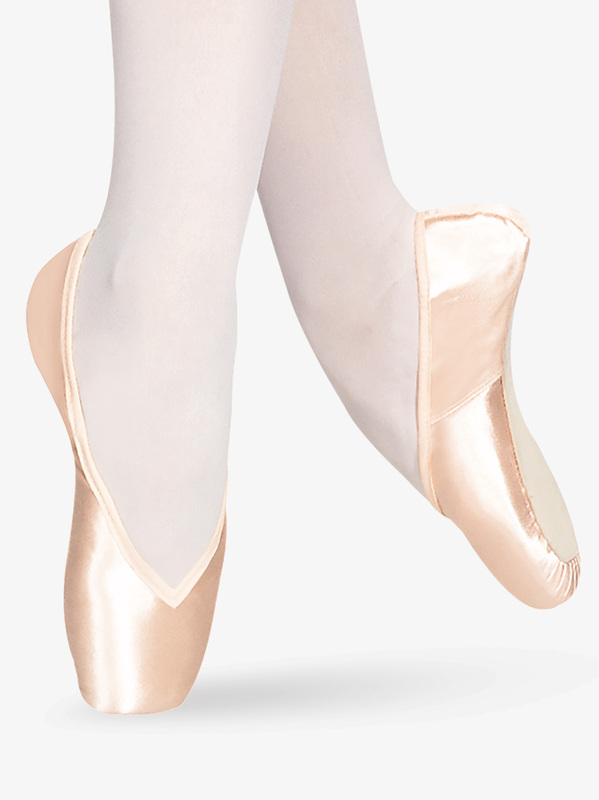 Mirella Adult Whisper Satin Pointe Shoes MS140: This whisper quiet and lightweight pointe shoe features a flexible shank at the heel which allows weight distribution to transfer to the heel rather than the toes, and a built in toe pad for extra comfort. Ribbons and elastic not included. 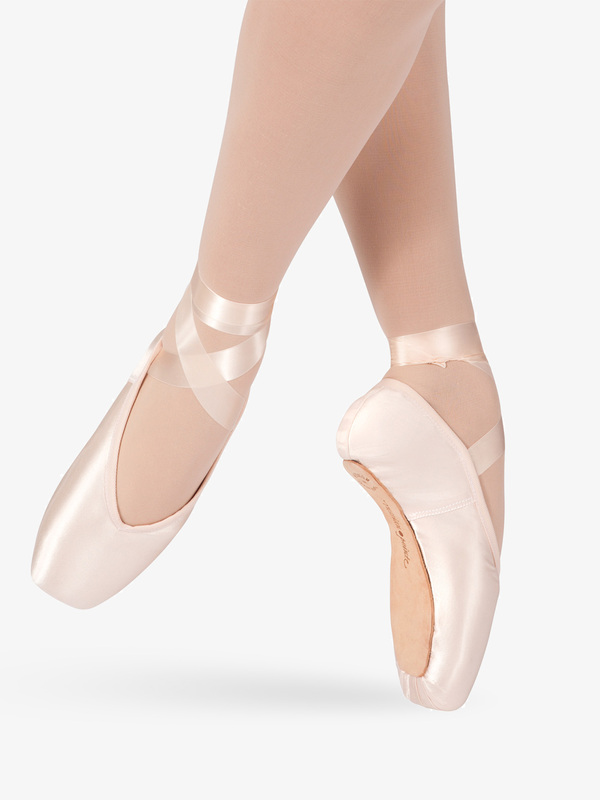 Mirella Adult Whisper Matte Pointe Shoes MS141: Great new look for stage! This new lightweight pointe shoe with flexible medium shank at heel allows weight distribution to transfer to the heel rather than the toes. Non-slip, built-in toe pad for comfort. Quiet on stage. Ribbons and elastic not included. 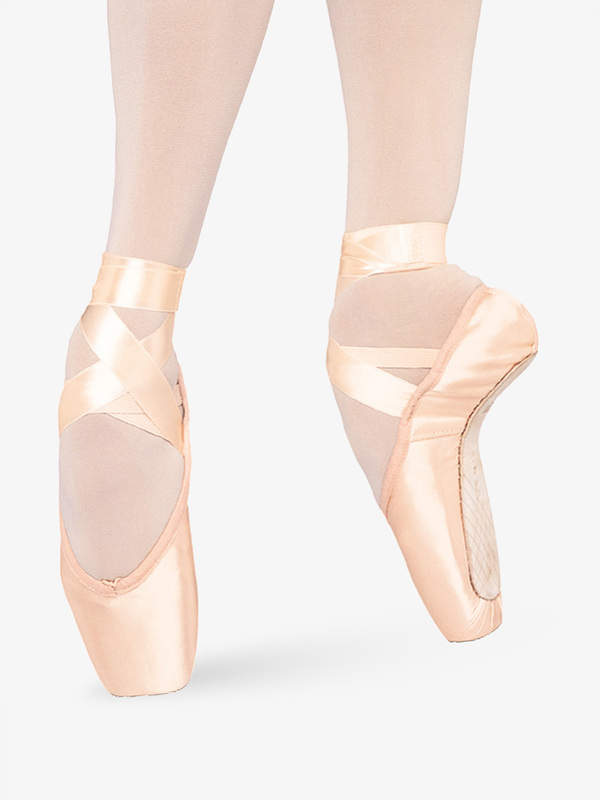 Russian Pointe Adult Almaz Pointe Shoes (Diamond) AD: Lightweight and quiet with a sleek pleatless toe platform and non-slip leather sole, the Russian Pointe Almaz (Russian for diamond) accommodates a variety of foot shapes and provides excellent stability. Best suited to the less-full foot with moderately tapered toes, Almaz features a low crown, medium toe platform, and fuller heel shape. Next-generation shanks provide flexibility and durability. Handcrafted in Russia in the grand tradition of pointe shoemaking. FREE Ribbons and Elastic Included with each pair! Russian Pointe Adult Brava Pointe Shoes BD: From Russian Pointe's Spotlight collection comes the Brava Pointe Shoe, with a subtly rounded platform to facilitate a more contemporary choreographic style as well as classical pointe work. Features also include a wide toe platform that is specially engineered for stability, best for even-length to moderately tapered toes. The Brava also features a wide toe platform, medium crown, pre-arched construction, and drawstring. FREE Ribbons and Elastic Included with each pair! Russian Pointe Adult Encore Pointe Shoes ED: Classic yet contemporary, the Encore by Russian Pointe combines a streamlined low crown with a moderately tapered box and medium platform to suit dancers with tapered toes or one or two even-length toes, and shallow to slightly full feet. The tapered shape from metatarsal area to heel accommodates the diamond-inch foot shape. 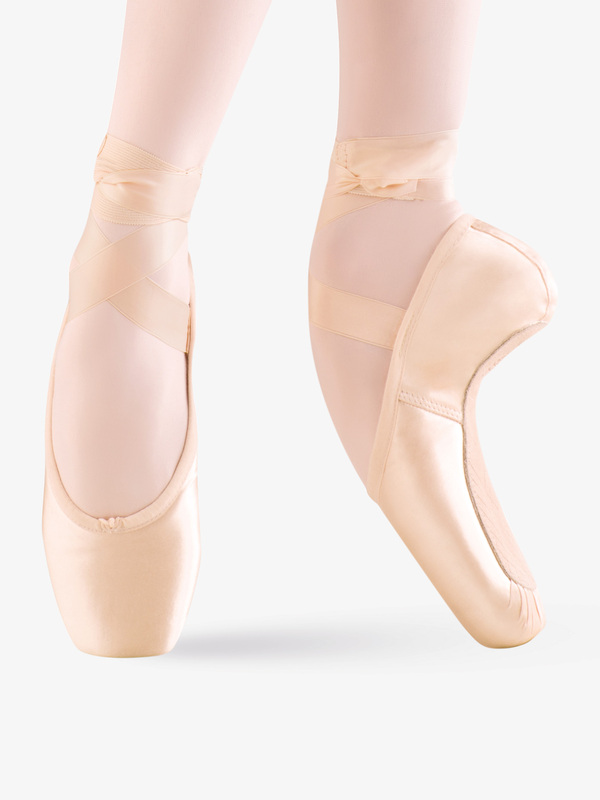 Pre-arched construction mimics the shape of the foot en pointe, decreases pressure on the front of the foot for high arches, makes it easier to reach full pointe for low arches, and minimizes break-in. Next-generation shanks provide flexibility and durability. Handcrafted in Russia in the grand tradition of pointe shoemaking. FREE Ribbons and Elastic Included with each pair! Russian Pointe Adult Entrada Pro Pointe Shoes EN: Designed with the timeless beauty of a classic, the Entrada Pro pointe shoe by Russian Pointe has a shallow heel, medium toe platform, high crown, and is best suited to the diamond-inch foot shape, with moderate fullness and moderately tapered toes. Available in sophisticated V-cut vamp without drawstring. Pre-arched construction throughout the shoe mimics the shape of the foot en pointe. Handcrafted in the grand Russian tradition with innovative construction to meet the exacting needs of today's dancers. FREE Ribbons and Elastic Included with each pair! 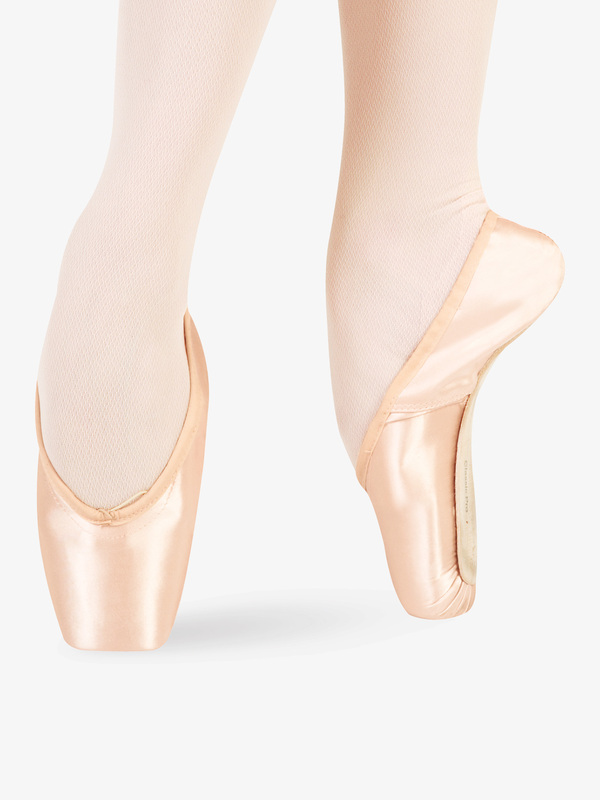 Russian Pointe Adult Lumina Pointe Shoes LD: Brilliantly versatile, the Lumina pointe shoe by Russian Pointe features a wide and very stable toe platform for superb balance and a low crown for a streamlined profile. 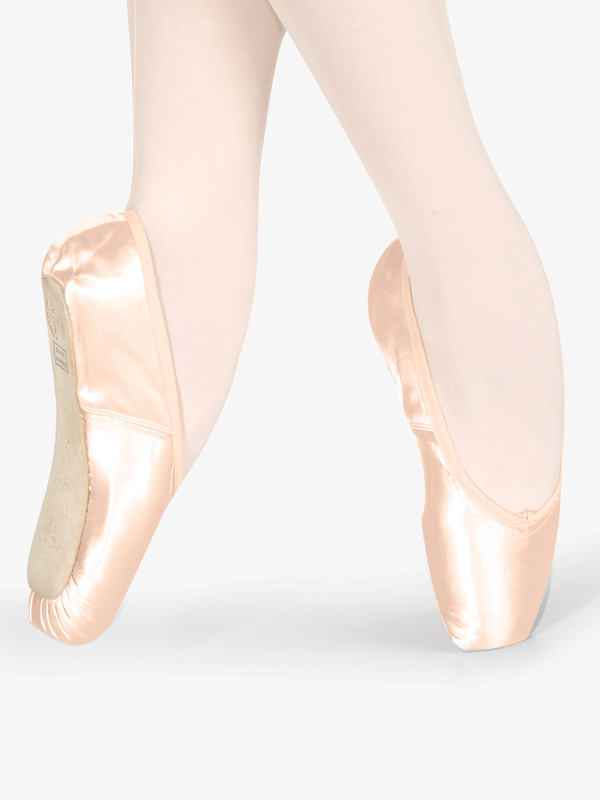 Lumina is perfect for dancers with even-length toes and shallow to slightly full feet. For the 'rectangular' foot (less tapered from the metatarsal area to the heel), Lumina has slightly more room in the heel. Pre-arched construction throughout the shoe mimics the shape of the foot en pointe, decreases pressure on the front of the foot for high arches, makes reaching full pointe easier for low arches, and minimizes break-in. Next-generation shanks provide flexibility and durability. Handcrafted in Russia in the grand tradition of pointe shoemaking. FREE Ribbons and Elastic Included with each pair! 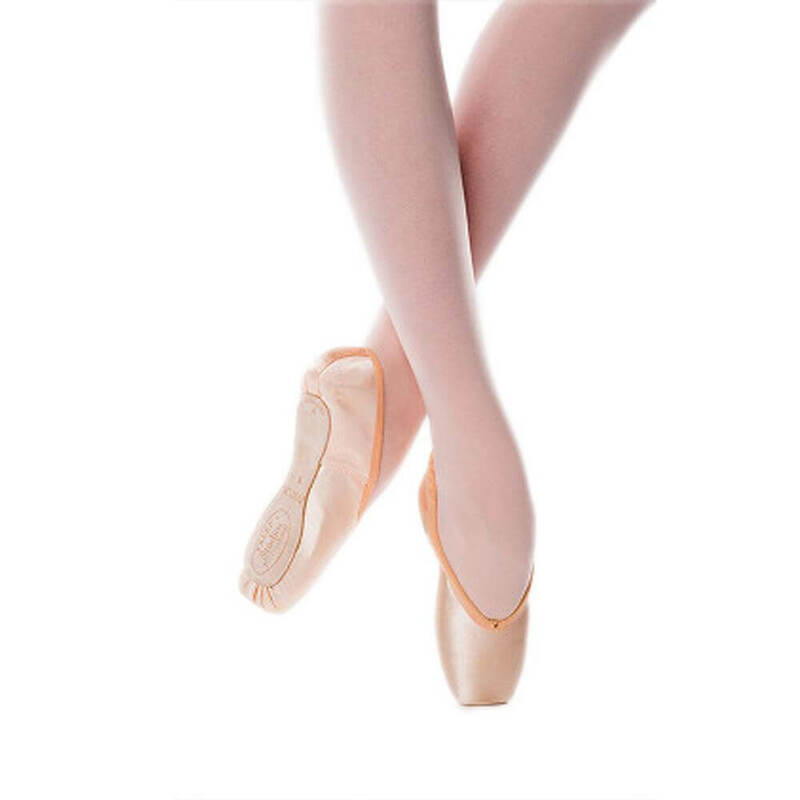 Russian Pointe Adult Muse Pointe Shoes MD: A marriage of traditional elegance with cutting-edge performance features, the Muse pointe shoe by Russian Pointe features an extra-wide toe platform that is perfect for the dancer who wants ample room for extra-thick gel toe pads. 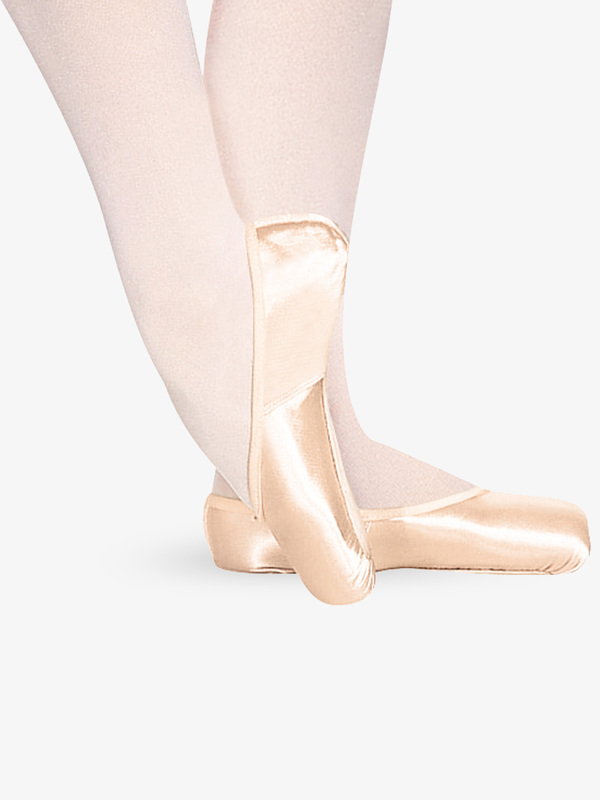 The extra-wide toe platform is also ideal for dancers who have three toes of the same length or a broad toe structure. Muse features Russian Pointe's famous pre-arched construction, which helps dancers with low arches reach full pointe and reduces break-in time to extend the life of the shoe. Handcrafted in Russia in the grand tradition of pointe shoemaking. FREE Ribbons and Elastic Included with each pair! Russian Pointe Adult Rubin Pointe Shoes (Ruby) RD: Perfect your pointework and shine on stage in this lightweight and quiet pointe shoe with a sleek, pleatless toe platform, and non-slip leather sole. 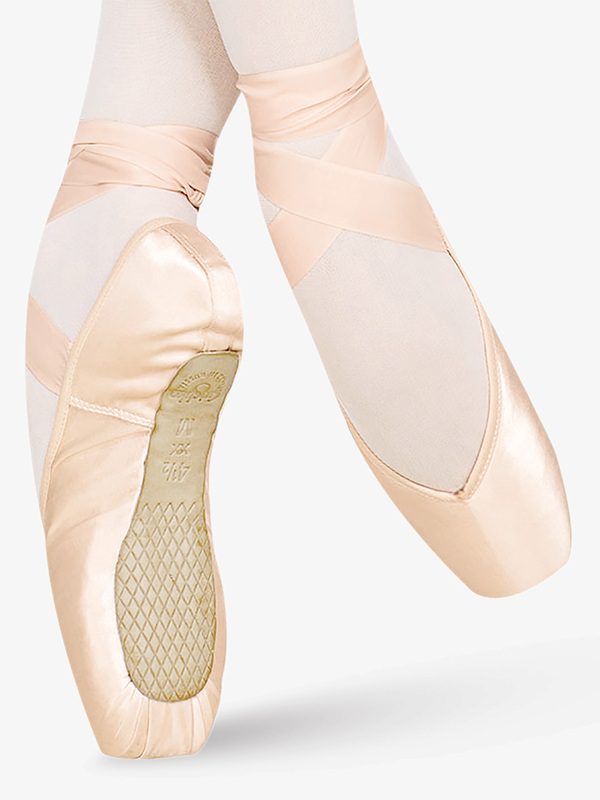 The hand-crafted Russian Pointe Rubin (Russian for ruby) features a wide toe platform, low crown, and Russian Pointe's pre-arched construction designed to mimic the shape of the foot en pointe, enhance longevity, decrease pressure on the front of the foot for high arches, and minimize break-in. Best suited to the less-full foot with square to slightly tapered toes. FREE Ribbons and Elastic Included with each pair! 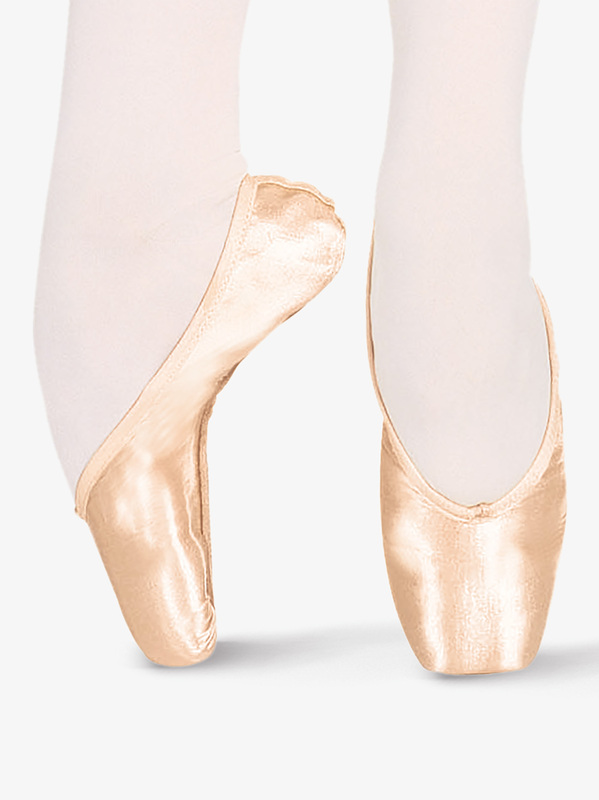 Russian Pointe Adult Rubin V-Cut Pointe Shoes RN: Perfect your pointework and shine on stage in this lightweight and quiet pointe shoe with a sleek, pleatless toe platform and non-slip leather sole. The hand-crafted Russian V-Cut Pointe Rubin (Russian for ruby) features a wide toe platform, low crown, and Russian Pointe's pre-arched construction designed to mimic the shape of the foot on pointe, enhance longevity, decrease pressure on the front of the foot for high arches, and minimize break-in. Best suited to the less-full foot with square to slightly tapered toes. V-cut does not come with a drawstring. FREE Ribbons and Elastic Included with each pair! Bloch Serenade Pointe Shoe: Bloch's Serenade has a similar heel shape to the Suprima and Sonata. The platform is wider so it is better suited to a dancer with square shaped toes. This also helps lateral balance and assists dancers who are inclined to sickle or fall off pointe sideways. It also provides superior lateral balance for the supporting foot when standing flat. Elastic and ribbons not included. Shank: Medium, Hard Imported.Sizes : 1-7 Adult, B, C, D (US Sizes)Suggested Fitting : We recommend a professional fitting for first-time pointe shoe purchasers.Best fit: Low profile and longer vamp length for longer toes that are more even in length.We recommend a professional fitting for first-time pointe shoe purchasers. Capezio Airess Broad M: New construction. Broad Toe-6.5 (Firm) shank, slight U shaped throat flatters the arch, elastic binding with encased drawstring, reinforced feather toe box for extended wear, quiet toe construction, platform is hammered flat to create a secure balance. Elastic and ribbons not included. Imported.Sizes : 5-12 Adult (US Sizes)Suggested Fitting : We recommend a professional fitting for first-time pointe shoe purchasers.Best fit: Medium width, broad toeWe recommend a professional fitting for first-time pointe shoe purchasers. Capezio Airess Broad W: New construction. Broad Toe-6.5 (Firm) shank, slight U shaped throat flatters the arch, elastic binding with encased drawstring, reinforced feather toe box for extended wear, quiet toe construction, platform is hammered flat to create a secure balance. Elastic and ribbons not included. Imported.Sizes : 5-12 Adult (US Sizes)Suggested Fitting : We recommend a professional fitting for first-time pointe shoe purchasers.Best fit: Wide width, broad toeWe recommend a professional fitting for first-time pointe shoe purchasers. Capezio Airess Broad WW: New construction. Broad Toe-6.5 (Firm) shank, slight U shaped throat flatters the arch, elastic binding with encased drawstring, reinforced feather toe box for extended wear, quiet toe construction, platform is hammered flat to create a secure balance. Elastic and ribbons not included. Imported.Sizes : 6-12 Adult (US Sizes)Suggested Fitting : We recommend a professional fitting for first-time pointe shoe purchasers.Best fit: Extra-wide width, broad toeWe recommend a professional fitting for first-time pointe shoe purchasers. Capezio Airess Taper M: New construction. Tapered Toe-5.5 (FlexiFirm) shank, slight U shaped throat flatters the arch, elastic binding with encased drawstring, reinforced feather toe box for extended wear, quiet toe construction, platform is hammered flat to create a secure balance. Elastic and ribbons not included. Imported.Sizes : 5-12 Adult (US Sizes)Suggested Fitting : We recommend a professional fitting for first-time pointe shoe purchasers.Best fit: Medium width, tapered toeWe recommend a professional fitting for first-time pointe shoe purchasers. Capezio Airess Taper W: New construction. Tapered Toe-5.5 (FlexiFirm) shank, slight U shaped throat flatters the arch, elastic binding with encased drawstring, reinforced feather toe box for extended wear, quiet toe construction, platform is hammered flat to create a secure balance. Elastic and ribbons not included. Imported.Sizes : 5-12 Adult (US Sizes)Suggested Fitting : We recommend a professional fitting for first-time pointe shoe purchasers.Best fit: Wide width, tapered toeWe recommend a professional fitting for first-time pointe shoe purchasers. Capezio Airess Taper WW: New construction. Tapered Toe-6.5 (Firm) shank, slight U shaped throat flatters the arch, elastic binding with encased drawstring, reinforced feather toe box for extended wear, quiet toe construction, platform is hammered flat to create a secure balance. Elastic and ribbons not included. Imported.Sizes : 6-12 Adult (US Sizes)Suggested Fitting : We recommend a professional fitting for first-time pointe shoe purchasers.Best fit: Extra-wide width, tapered toeWe recommend a professional fitting for first-time pointe shoe purchasers.